(Photo: Assemble point) My wife gave me a condition for this trip, she needed my car for shopping. Fortunately Yung Ming offered me a lift to KL. 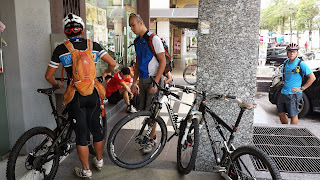 I was picked up at 4.00am, and the group met at Shell petrol station near the 2nd causeway. 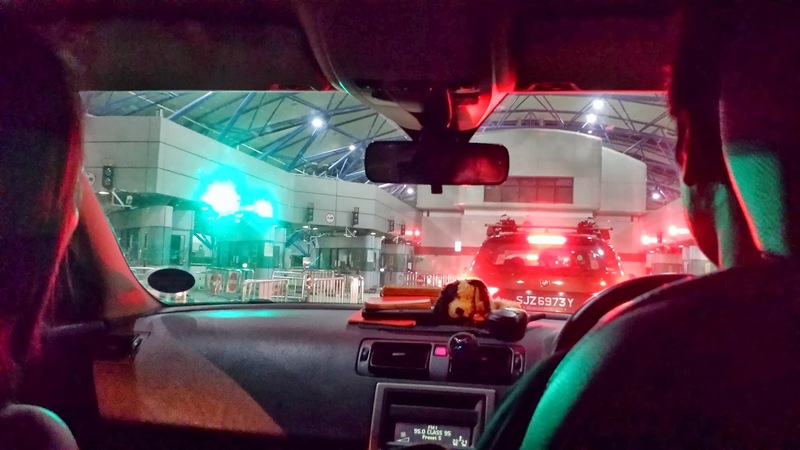 (Photo: Tuas Check Point) Early birds have its advantage, almost empty checkpoint. 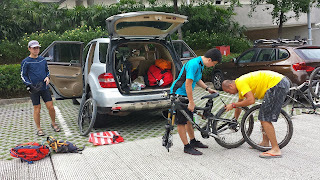 We kept all our bikes inside the cars, as the checkpoint security cameras were too low for our roof racks to past. (Photo: Rest point) We stopped over at the next rest point to have our breakfast and lunch. 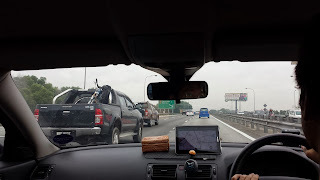 (Photo: North South Highway) Easy and nice drive along the NS highway. 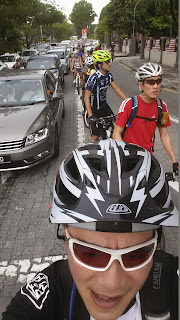 Overtook by a Malaysian truck, carrying a Santa Cruz bike! First sign that we were near KL. 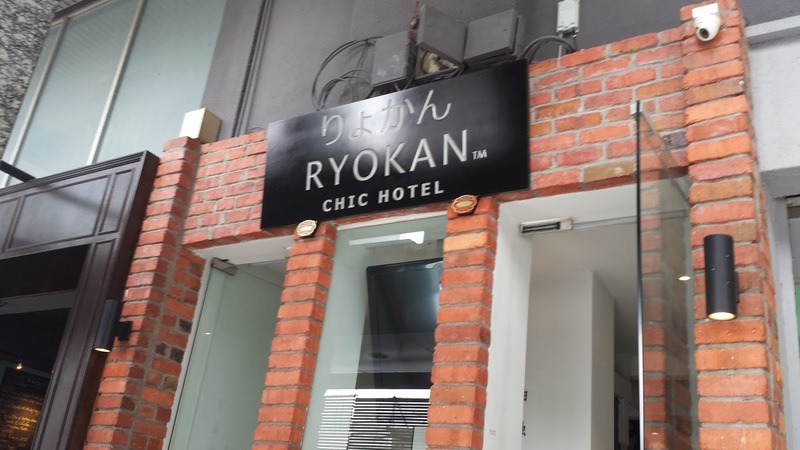 (Photo: Ryokan Chic Hotel) Arrived at the hotel about 10.30am. 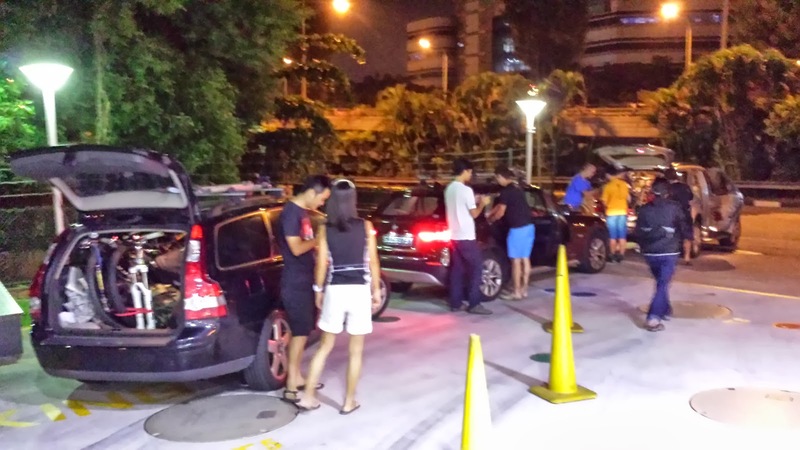 Although parking were plentiful around the hotel, the spaces were mostly full. This boutique hotel has about 50 rooms, and we paid about S$60 per night for a twin room including breakfast. 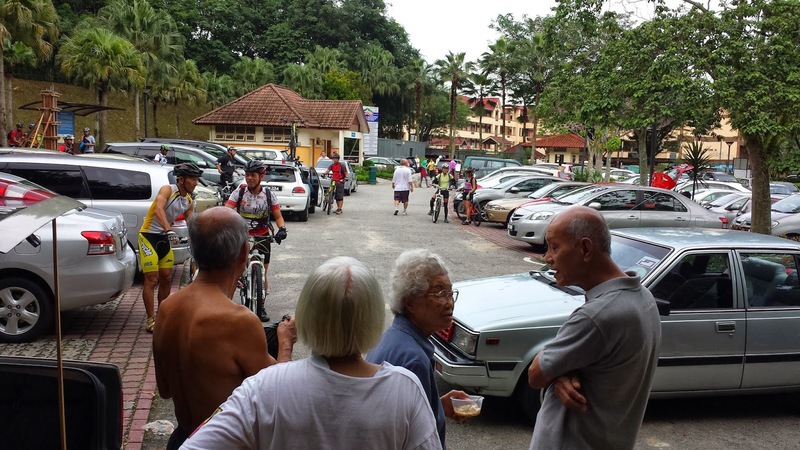 Besides a short 10 minutes ride to Bukit Kiara, the Ryokan Chic Hotel also allowed bikes inside the rooms. (Photo: Reception) As check-in time was 2pm, we requested for one early check-in room to keep all our luggage and refresh ourselves. (Photo: Hotel Room) The room was tiny. 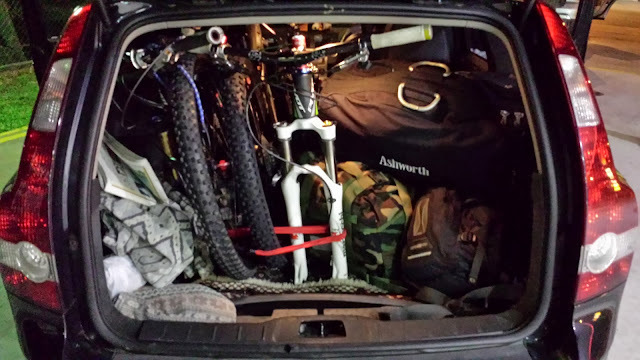 It would be too small to accommodate 2 bikes. 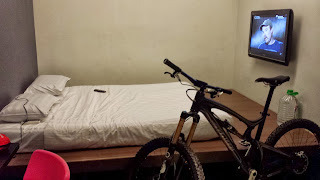 I had the twin room all by myself, as Jason Lim who supposed to bunk with me withdrew last minute. 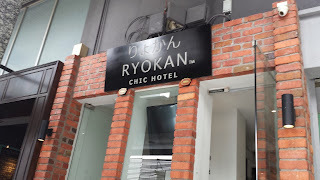 The Ryokan Chic Hotel is only a short 10 minutes ride to Bukit Kiara. (Photo: Coffee shop near Ryokan Hotel) Before the first ride in KL, we managed to get some food at this coffee shop, just a few shops away from our hotel. 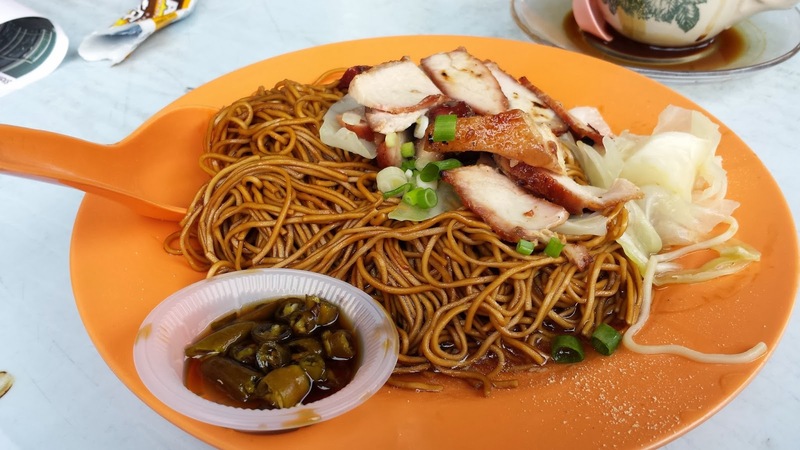 (Photo: Wan Tun Noodle) The foods were generally good in comparison to Singapore hawker foods. 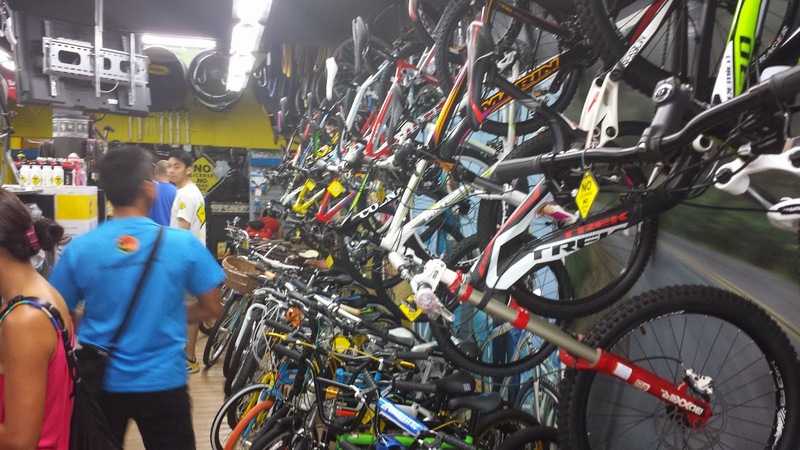 Prices were relatively cheap due to 2.55 exchange rate. Malaysia street foods use lots of pork lard, which makes the food more tasty. (Photo: Joo Ngan Son Bike Shop) We visited a bike shop, just a short walk from our hotel. The price is generally cheaper than Singapore. KH cycle Malaysia has a shop nearby too, but it was closed during our stay. After settling our luggage, eat and shop, we were ready to do our first ride in Kuala Lumpur. 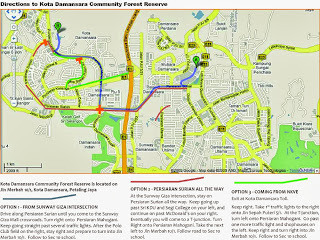 Kota Damansara Forest Reserve was gazetted as a Permanent Forest Reserve on 18 February 2010. The above photo illustrates the entry point to Kotal Damansara mountain bike trails. If you like butterfly, this will be for you. It is a flowy version of Butterfly. 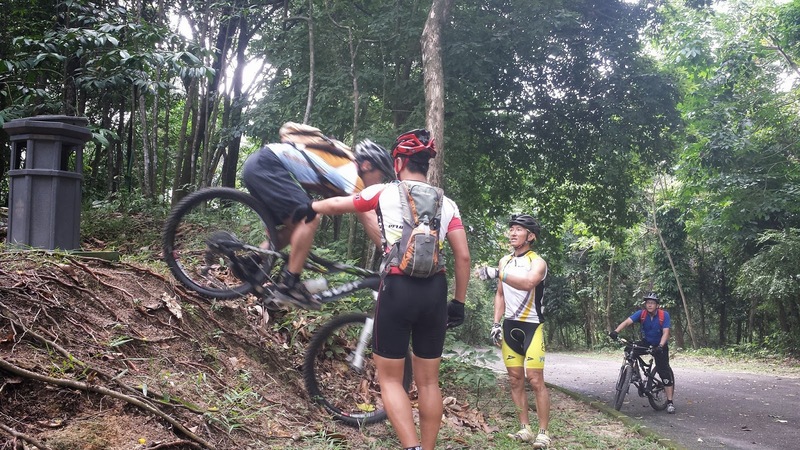 For those who ride with more than 710mm wide bar, be careful of the trees here. 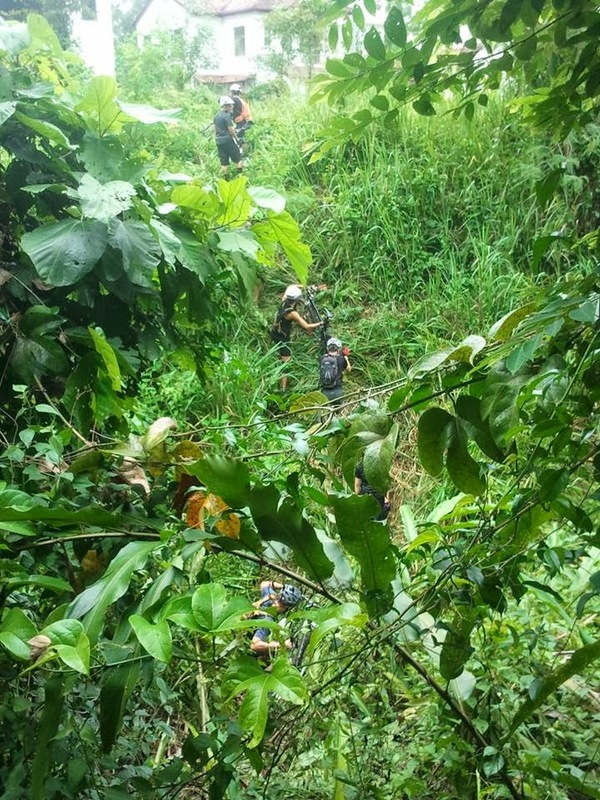 The single trails were narrow with in between trees and hanging creepers. 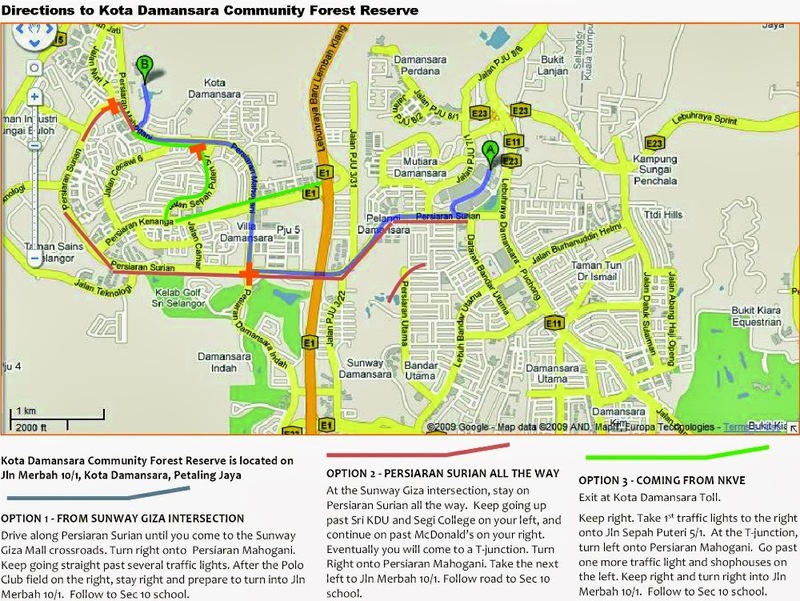 (Photo: Courtesy from KDCF Society) The photo on the left illustrates the direction to Kota Damansara Community Forest, which is a short distant drive from Bukit Kiara. Use google map to navigate your way there. 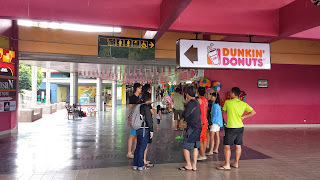 (Photo: Arrived at Kota Damansara) It took us about 20 minutes to drive from our Hotel to Kota Damansara. 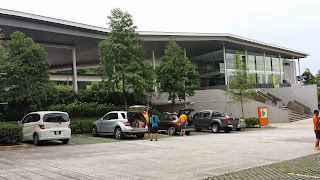 There are amber parking space along the road side. We arrived around noon time, and the weather was perfect! 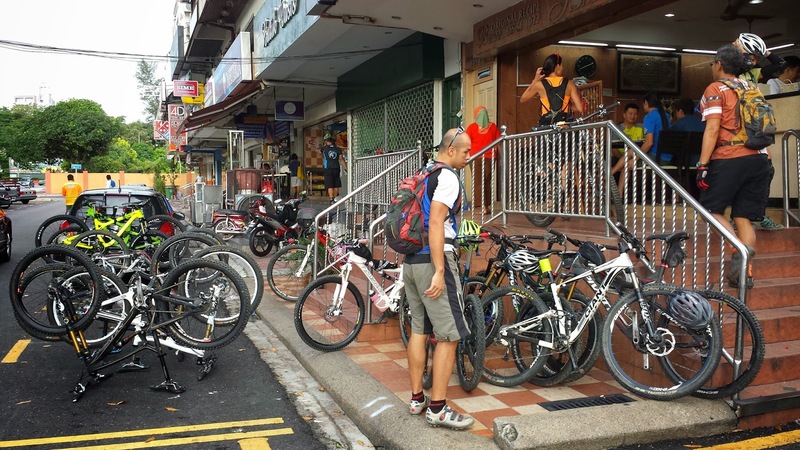 (Photo: Kota Damansara) Some house rules to follow when you ride here. 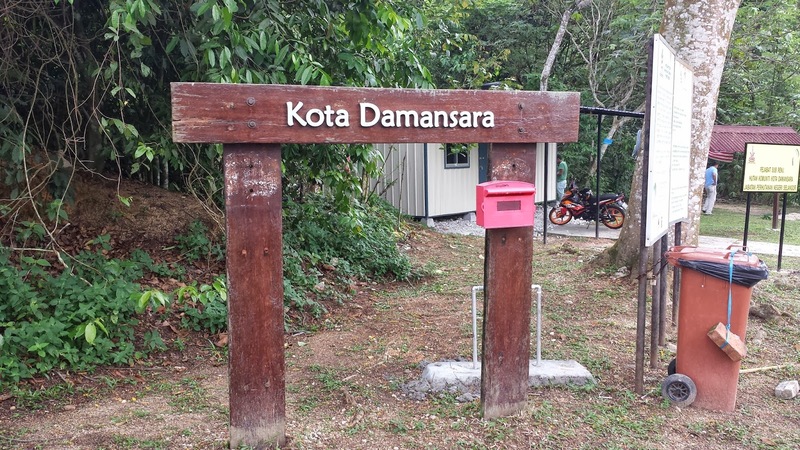 (Photo: Kota Damansara) As usual, the faster team in the group would go first. 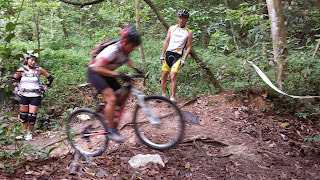 (Photo: Yung Ming) Exiting the end of the trails. This harmless looking wooden bridge has taken few casualties when wet. (Photo: Nik) Completed a loop and ready to go in again. (Photo: Christina) Satisfied and happy looking Chris after completed one lap. Rebbeca following closely behind. 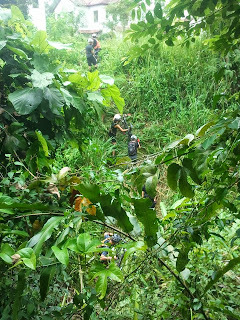 (Photo: Courtesy to the group that stuck in the wrong trails) Taking the wrong turn into an unridable line can be disastrous. 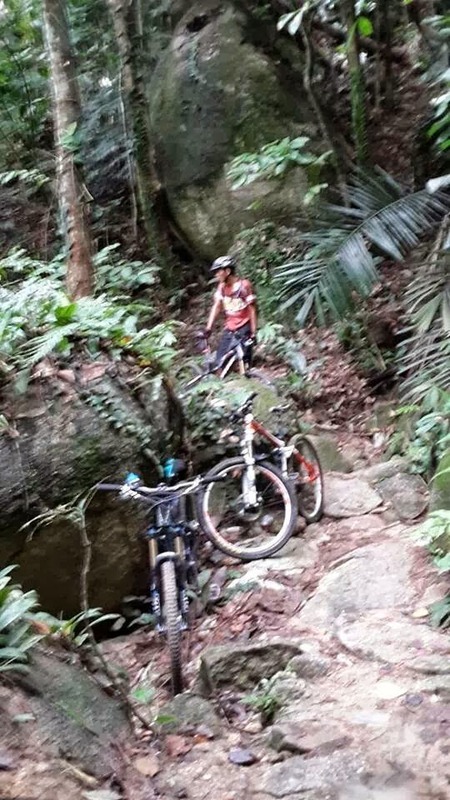 The infamous disastrous trail is about 2km long, of which 1.8km is unrideable. If you accidentally went in, good luck. 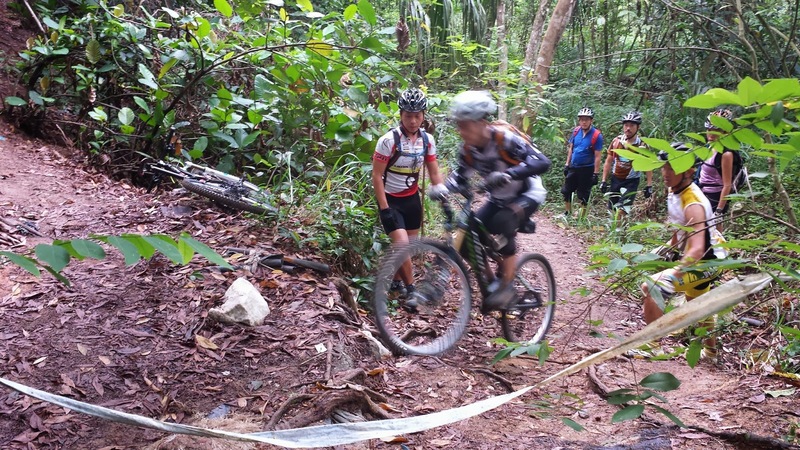 The faster team took the wrong turn and stuck inside the trails for so long that after they exited from the trails, some of us had already completed 2 to 3 laps. (Photo: Kota Damansara) Beautiful scenic view of Kota Damansara. 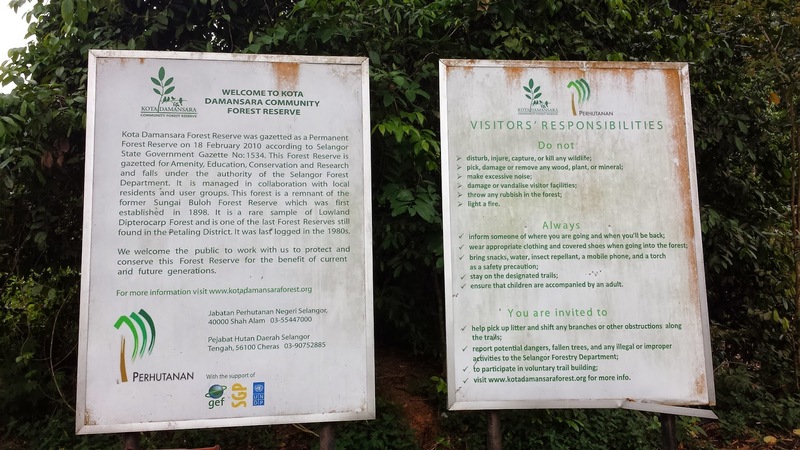 It was a shame that we did not take a single photo inside the trails. 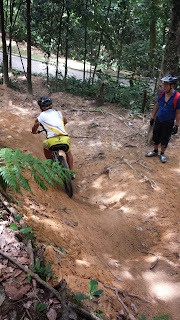 We enjoyed riding every inch so much that we did not bother to stop and take photo. 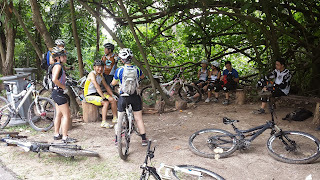 (Photo: Resting Hut) After the ride, we took a rest in the shelter to recharge before going in again. I did 2 laps, Ming did at least 4 laps, while some did at least 3 laps or more. 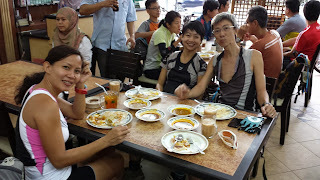 Kenny met up with us for the ride as well, after completed over 100km of road riding in the morning! 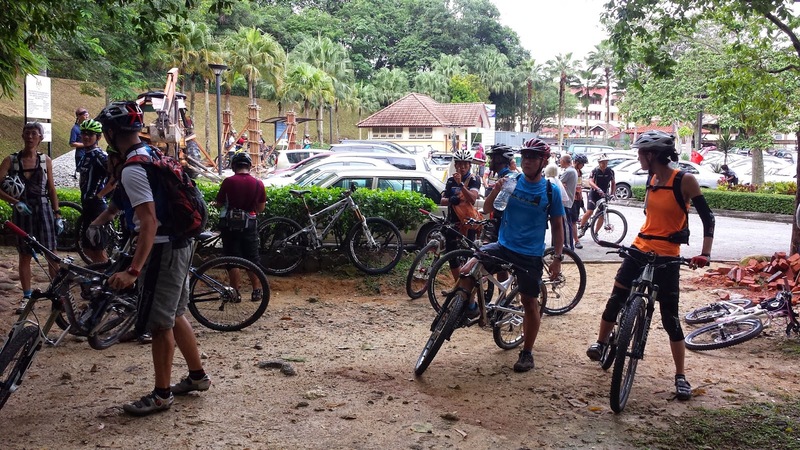 We absolutely enjoyed Kota Damansara, a warm up ride for Bukit Kiara. 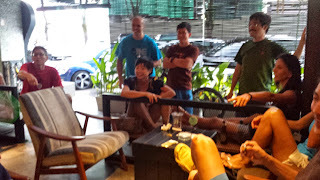 After the ride, we got ourselves refreshed in the hotel and gathered at the reception area before heading for dinner. The seafood restaurant is just a short walk from our hotel. 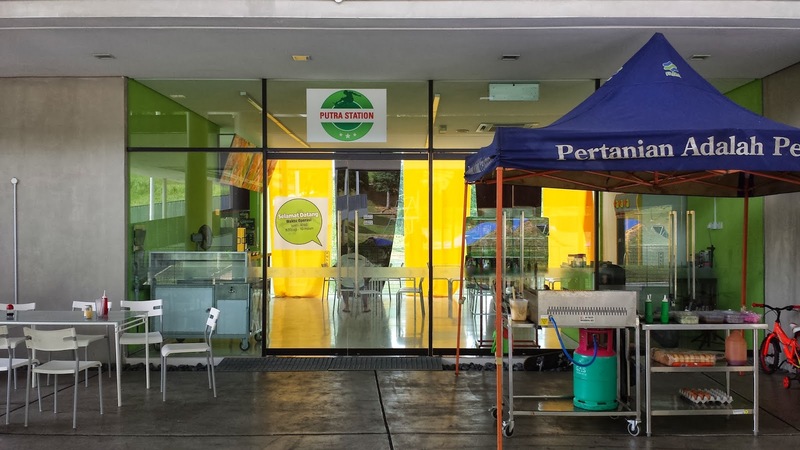 The sight of the restaurant already made our stomach grumbling. 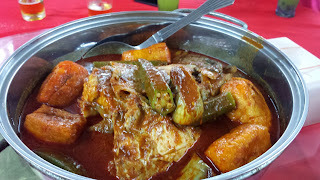 This curry fish head is the signature dish in this seafood restaurant, really awesome! The curry was tasty and full of flavor. The fish was tender and fresh. Could not have asked for more. We also ordered fried rice, clams, vegetables. 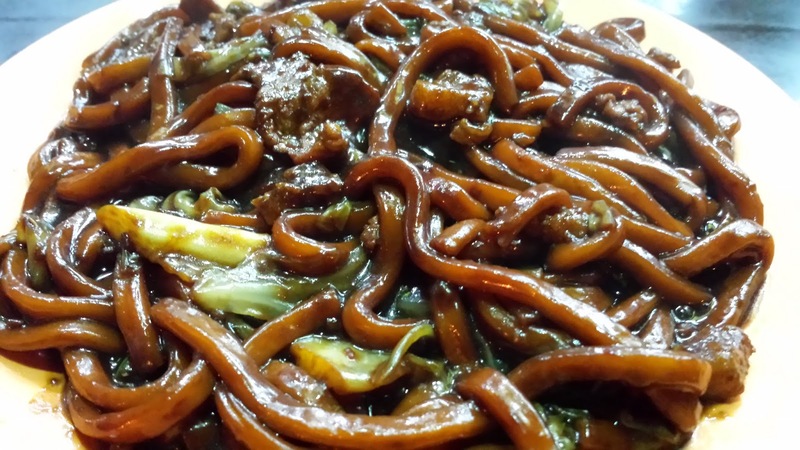 calamari, and many other dishes. They were all as good. Perhaps, all food seems to taste better when you are hungry. 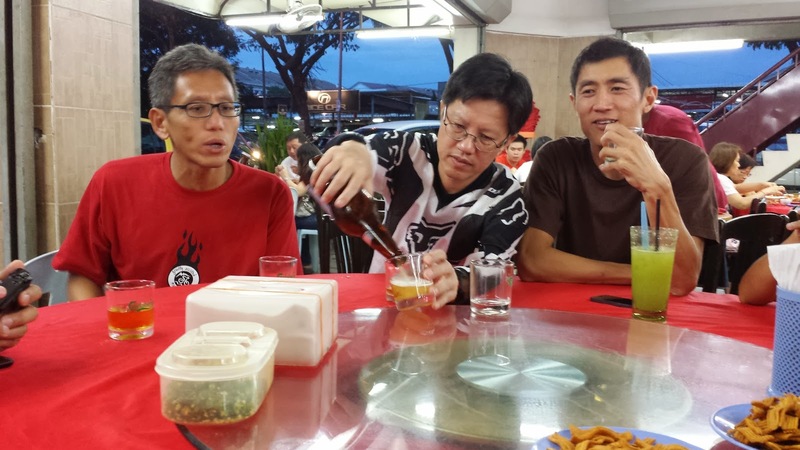 How could anyone finish the feast without beer? We ordered a few bottles of ice cold Asahi to go along with the food. See how Chi Wei dazed at the sight of chilling Asahi, while Lai Thutt volunteered to serve us. While strolling back to the hotel after dinner, Nik spotted this hokkien prawn noodle shop. We could not resist and stopped over for another round of mayhem. 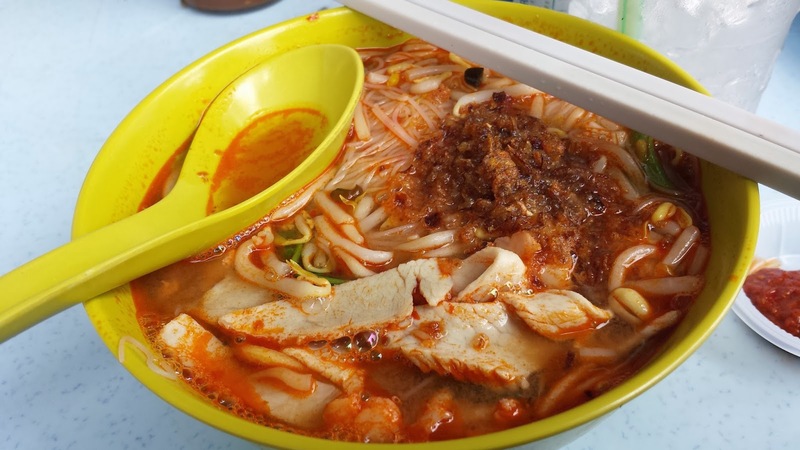 Best hokkien prawn noodle I have ever eaten for a long time. The noodle was bouncy and full of dark sauce flavor. 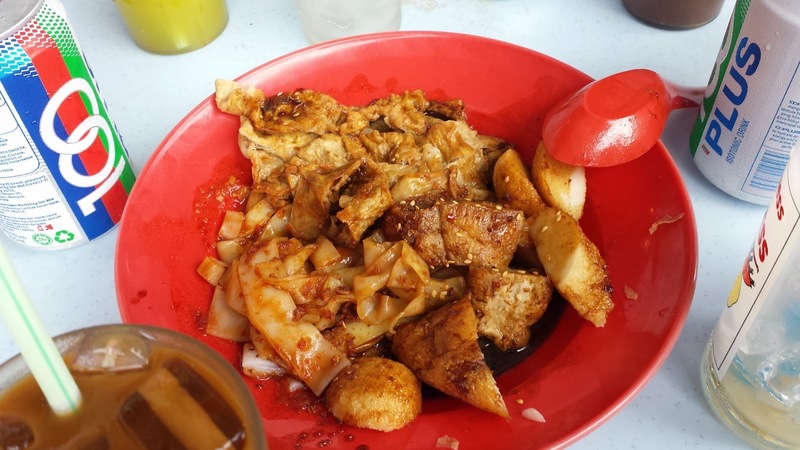 The pork lard amplified the taste of prawns and noodle. Highly recommended! Most of us called it a day after dinner. 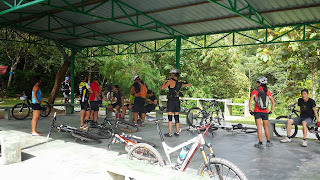 Time to rest for next day Kiara ride. 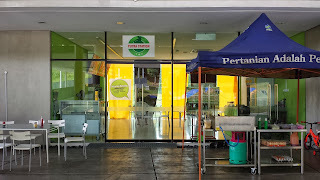 Bukit Kiara locates in Kuala Lumpur, Malaysia. 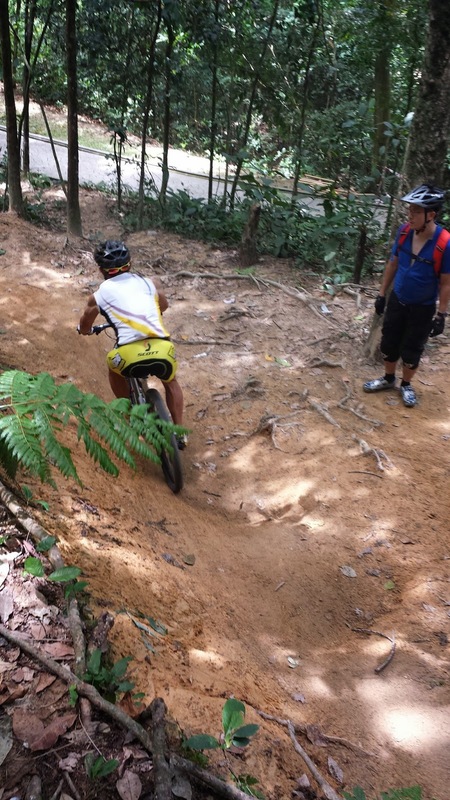 It is one of the best mountain bike trails in this region. 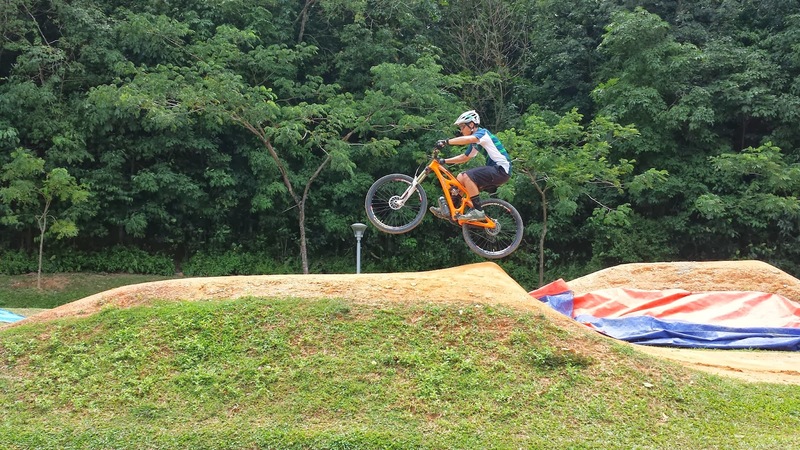 Recently, it was selected as the venue for Asia first enduro race. 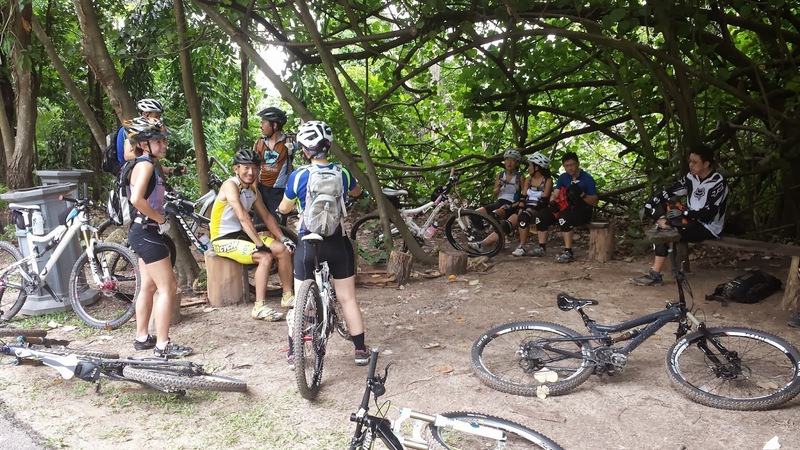 I have heard so much about Bukit Kiara mountain bike trails. 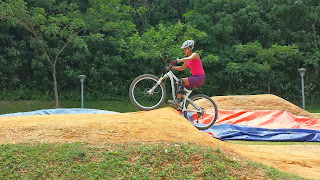 In fact, Kiara was the highlight of this 3 days riding trip in KL. 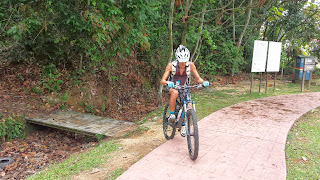 If you are a serious mountain biker, be it XC, AM or DH disciplines, Bukit Kiara must be included in your riding plan! We gathered around 8am outside the hotel. Some of us managed to have hotel breakfast, with the intention of having second breakfast later. 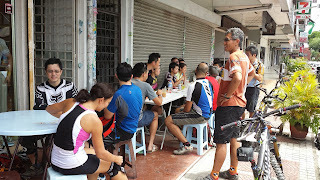 At about 8.30am, we rode to a plata restaurant near Bukit Kiara mountainn bike trails for breakfast. James came early to lead us there. The plata restaurant is only about 10 minutes riding distance from our hotel. Nik and I took the overhead bridge routes advised by Jason, while the rest followed James on the main roads. We arrived at the restaurant almost the same time. 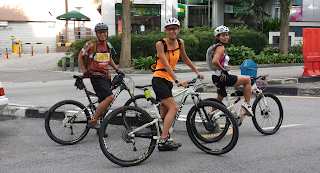 (Photo from left: Ting, Chee Han and Jack) They were among the fastest riders in the group. 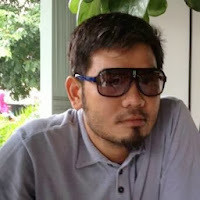 Ting is one of the founders of The Chain Reaction Project, a social enterprise in Singapore. 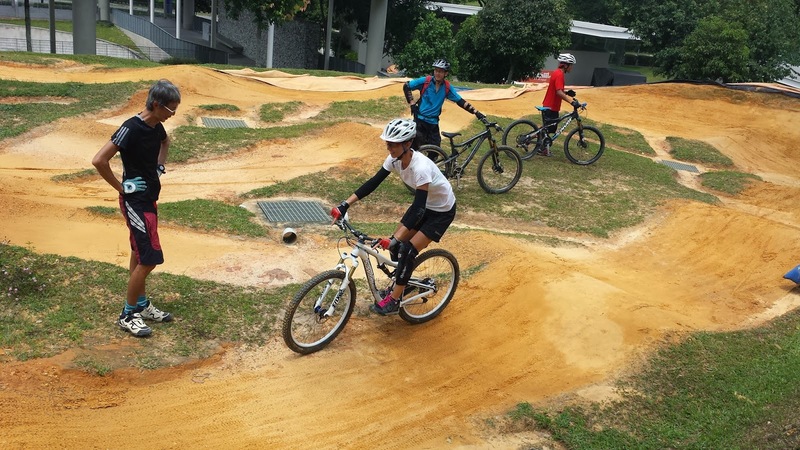 She can ride anything with XC bike, highly skillful and competitive. 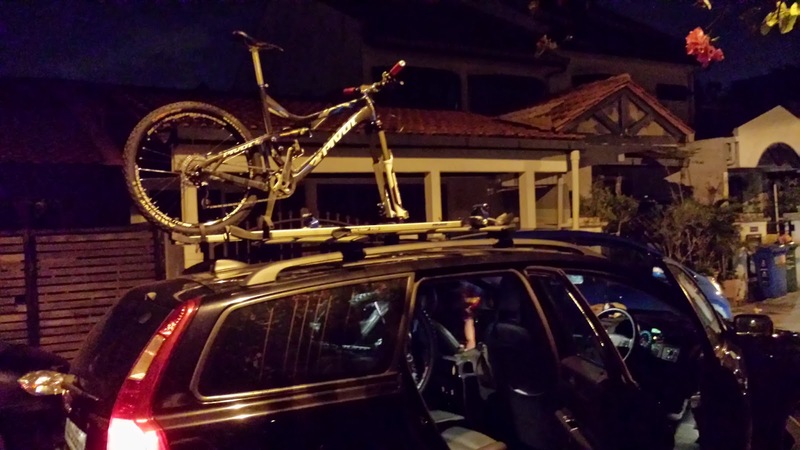 Chee Han recently came back from 8 days gruesome ride in Peru. Jack is always helpful and thoughtful, a real gentleman. (Photo from left: Jonie, Wilson, James and Kenny) Jonie won the women category in Asia first Enduro Race. Wilson is a professional mountain bike instructor. 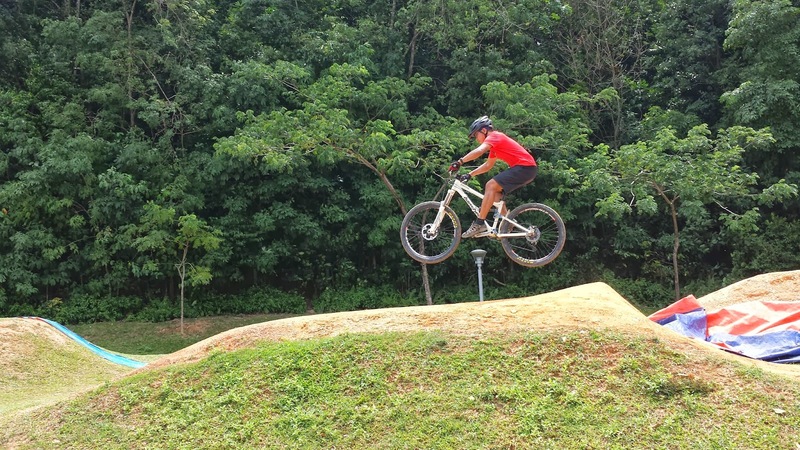 James is one of the pioneers who make Kiara mountain bike trails possible. Kenny is my idol and sifu, he is an awesome mountain bike instructor in Malaysia. (Photo from left: Ming, Jessen, Yew Weng, Hans, Lai Thutt and Christina) Ming is a well respected, skillful and experienced rider...a good buddy. 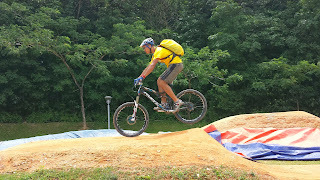 Jessen is my sifu, an awesome mountain bike instructor in Malaysia. 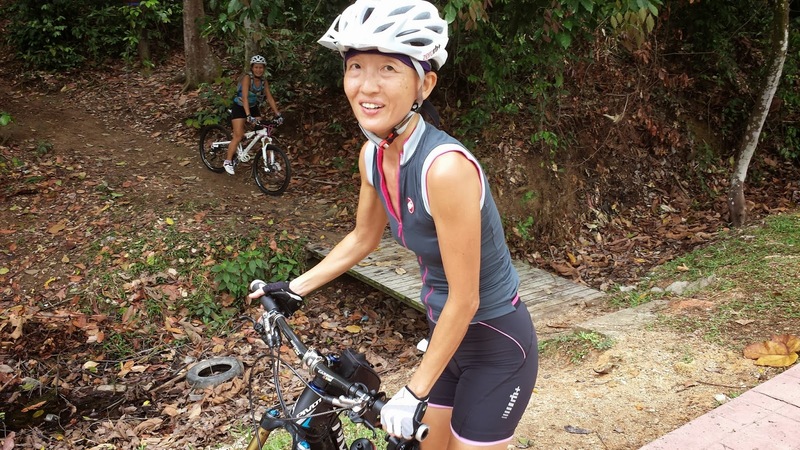 Both Yew Meng and Tai Lutt are inseparable riding buddies. 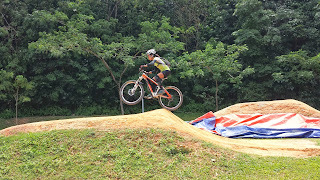 Hans is born to ride, highly talented and fast rider! 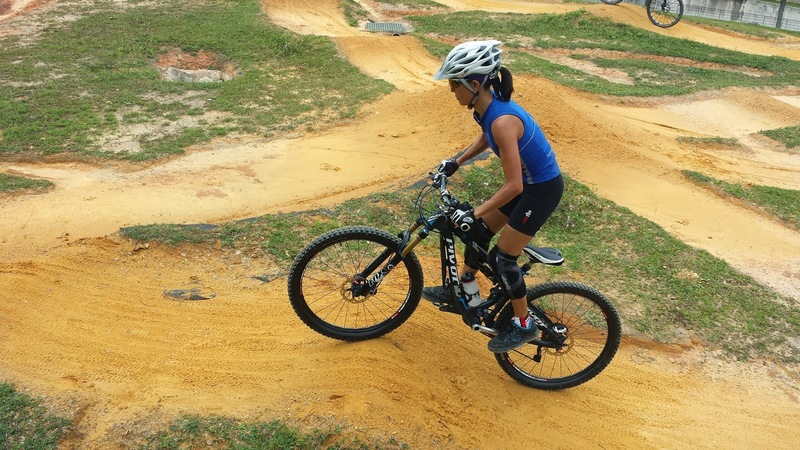 Christina is an awesomely skillful and steady rider. 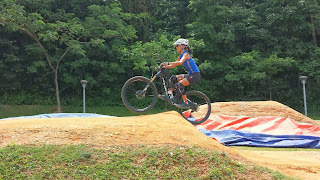 She can beat most of my riding kakis, me included. (Photo from left: Rebecca, Pei Ling and Nik) Rebecca is a joyous and determine rider. She will not give up trying! Nik size can be deceiving, he ride faster and longer than many young men. 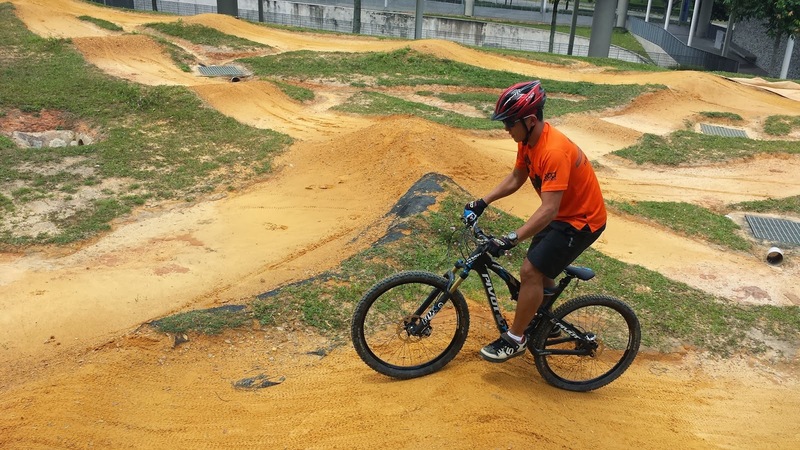 He is one of the brain child behind Tampine Bike Park. 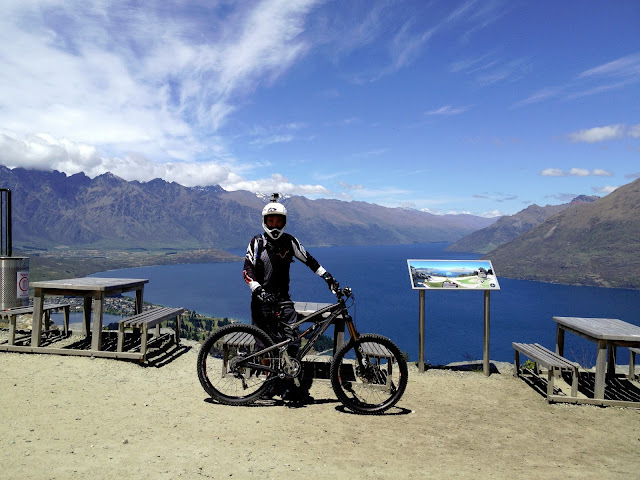 He was so impressed with 7 miles in Queenstown that he designed Tampine bike trails according to 7 miles blue print. Together with Pei Ling, we could not stop laughing with Nik sense of humor. 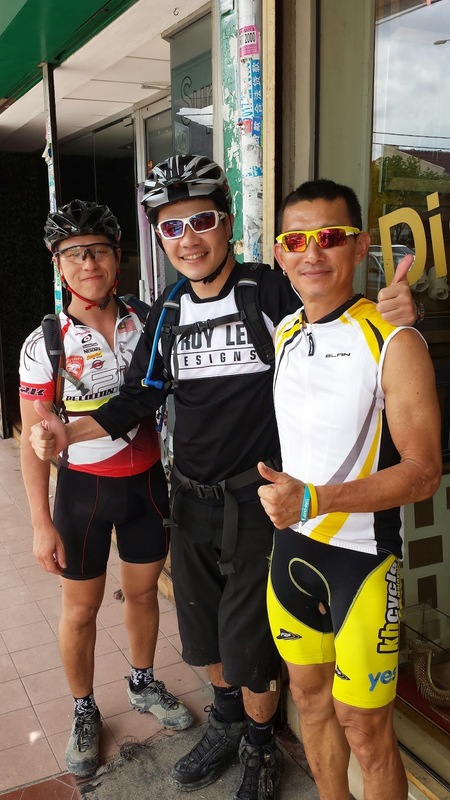 (Photo from left: Chi Wei, Lee Keng and Sarge) They are highly skillful riders, and could climb and ride any terrains threw to them. Chi Wei just came back from 8 days gruesome ride in Peru. 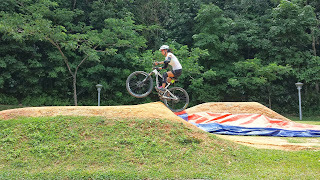 Sarge did all the jumps and drops on his short travel bikes. 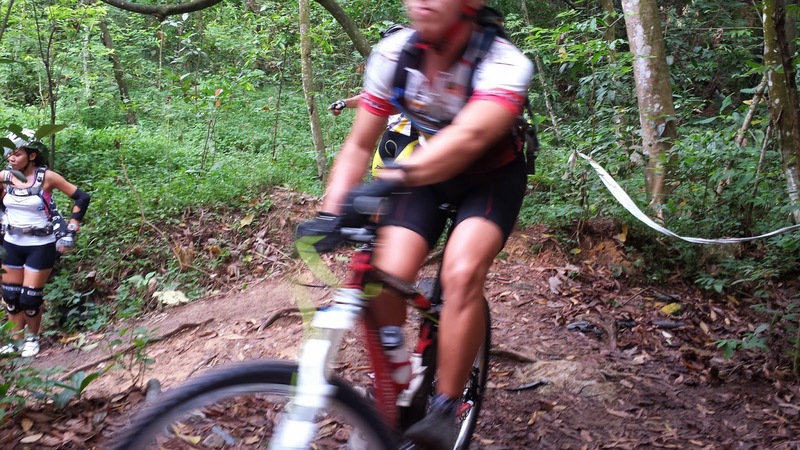 Lee Keng (wife of Sarge) is an endurance rider, highly skillful and steady. 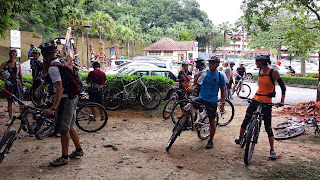 (Right Photo) After breakfast, we convoyed in one big group and pedaled our way to Bukit Kiara mountain bike trails. 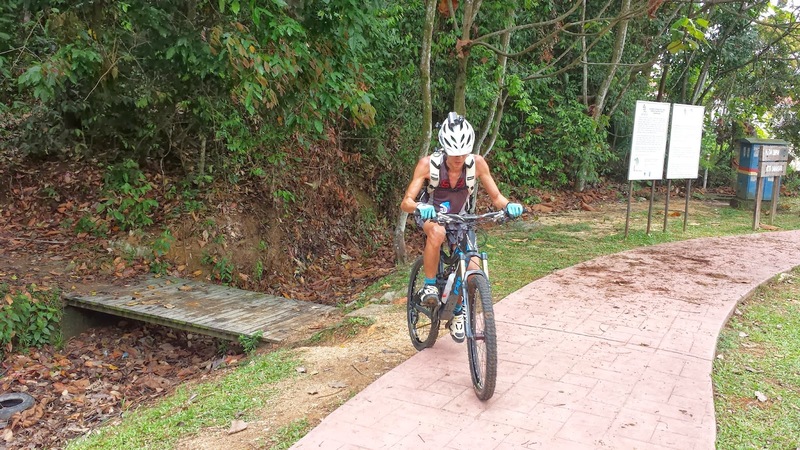 (Left Photo) Surprisingly, the entrance to Bukit Kiara trail resembles that of Bukit Timah trails in Singapore. The car park situates just in front of the trails' entrance. Similar to BT, the car park was full of cars during weekends. 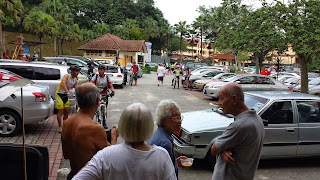 Old folks and young families gathered for exercise and chit chat. Local mountain bikers came in fleet to enjoy their ritual ride over weekend. 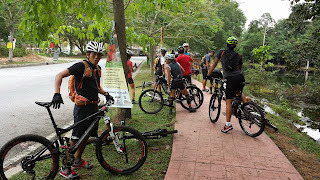 We were ready to enter the trails. 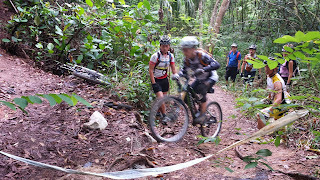 At kiara, the group was split into 3: James led the kiara classic group, Jonie, Jason and Chris Khoo led the enduro group, Kenny and Jessen led the coaching group! 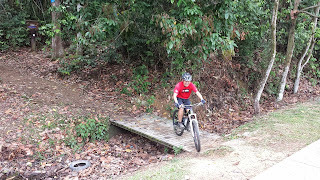 The trails started with a short ride to a long steep climb. 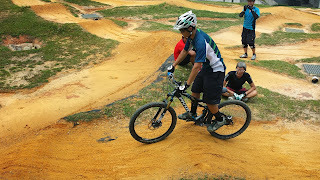 Kenny showed us the proper posture to ride downhill before we entered this session. 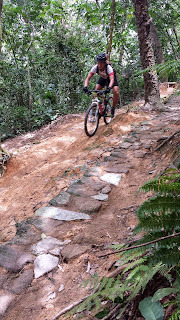 Jessen showed us the correct way to tackle this steep tight switchback. He rode the more difficult rooty line. 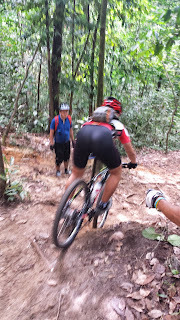 Jessen did a quick switchback to exit after the steep climb. (Left photo) Lai Thutt successfully did the steep tight switchback, riding on the more difficult rooty line. (Right photo) Christina making her move down the gnarly slope with style. Thanks to the coaches, we were able to tackle this slope with confident. I have also learnt a lot from Christina, she is an experience and steady rider. Always feel comfortable to ride with her and Ming! (Left photo) Kenny and Jessen taught us how to leverage on small humps to gain some air time and clear obstacles that would have slowed you down. Thanks Ming for this awesome photo. (Right photo) Kenny and Jessen taught us how to clear triple terrace. You always feel safe with them around. (Left photo) Kenny and Jessen made us practice the the correct posture to tackle steep downhill before going in for the real stuff. We practiced many rounds until they were satisfied with our posture and braking techniques. (Right photo) Before going down this steep downhill track, Kenny made us walked the lines, and visualized how we ride down the steep slope. 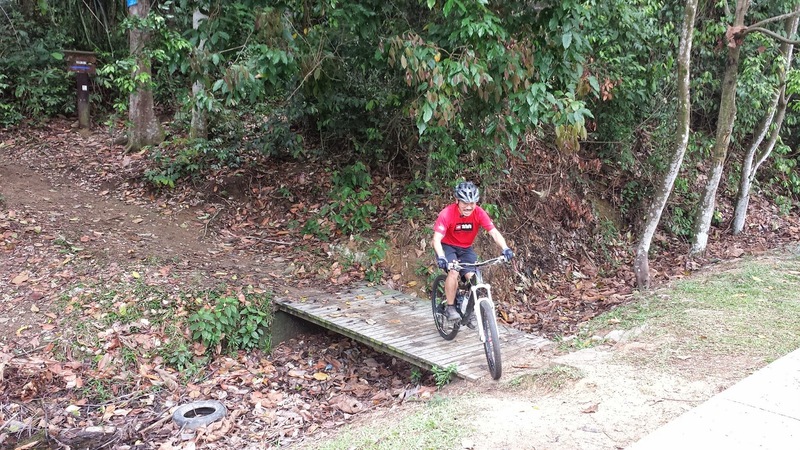 The routine helped to build our confidence, especially when it was our first attempt on this trail. 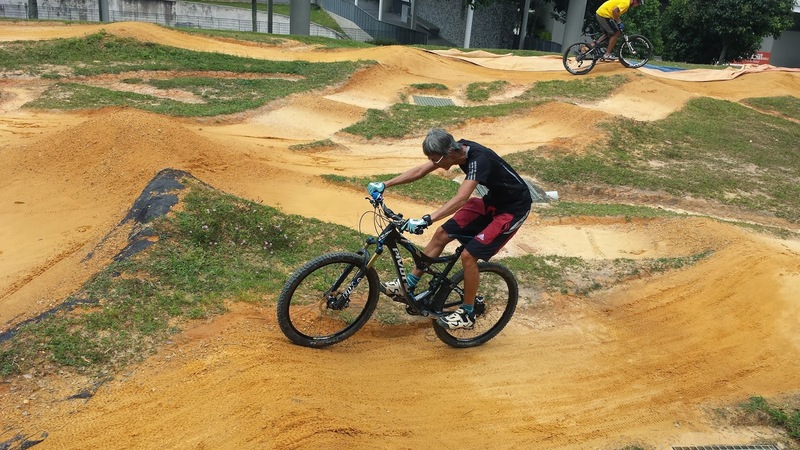 (Right Photo) Jessen showed us how to tackle this downhill track with his short travel hard tail bike! Super awesome! 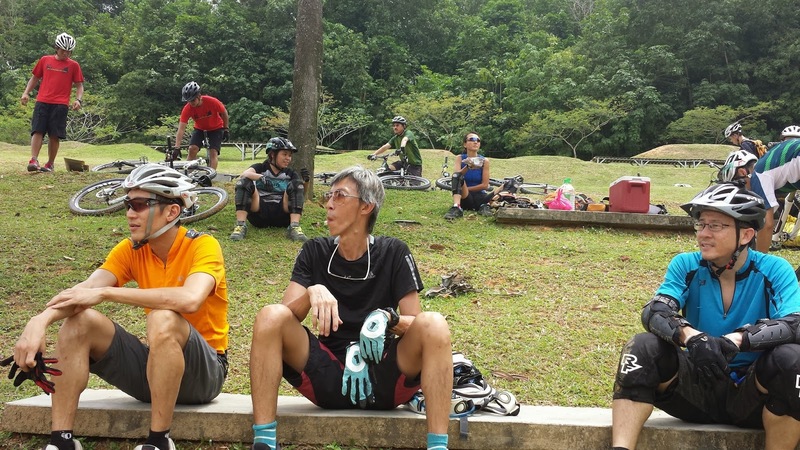 (Left photo) After successful attempt all the obstacles we came across, we took a rest here. 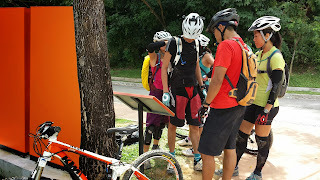 We shared the learning points and get ourselves recharged before proceed to the next trails. 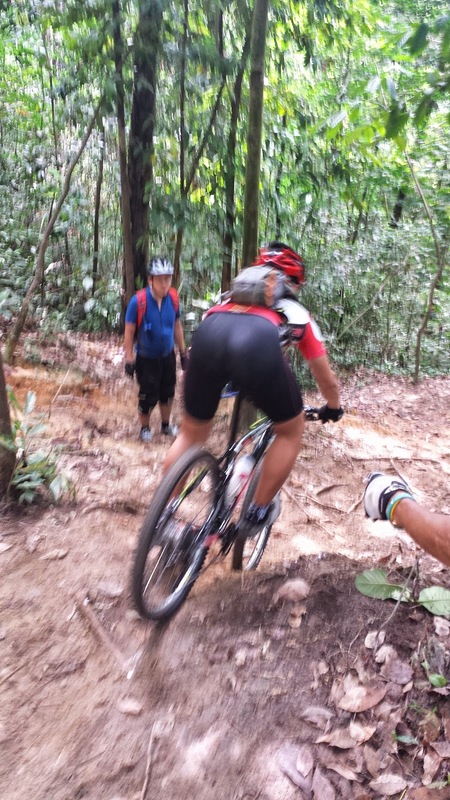 (Left photo) Kenny showed us the correct way to tackle this tight downhill switchback. We were very attentive on each movement Kenny's made. All of us successfully attempted this section. 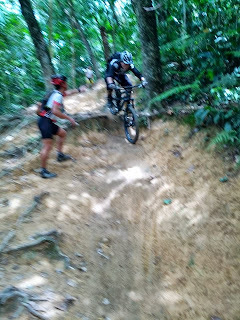 (Right Photo) Another attempt on this steep slope. 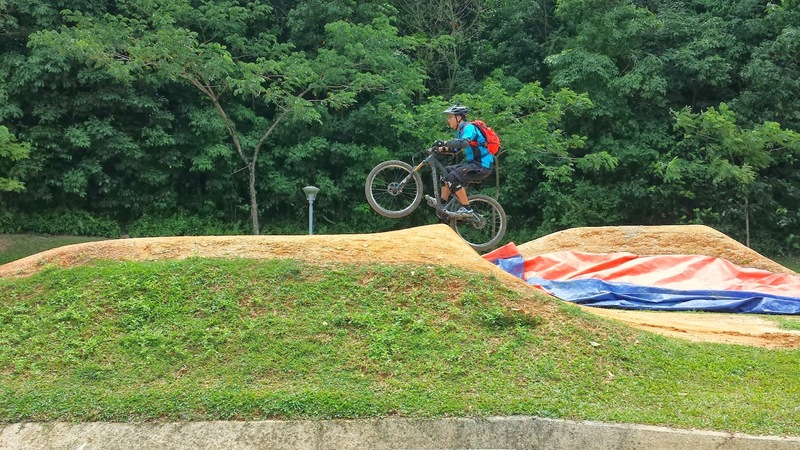 (Left Photo): Kenny demonstrated the proper way to tackle this down slope, while Yew Weng watched every details of his move. 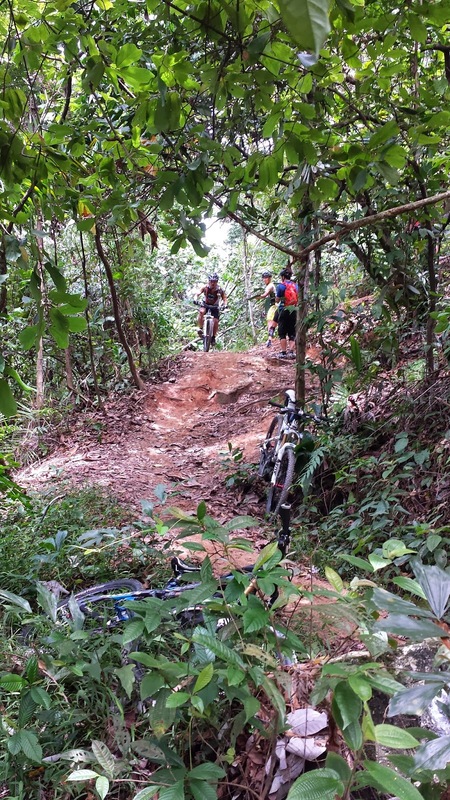 (Right photo) Not too sure about this trail in Kiara. This shot was copied from Facebook posting by James. He led the first riding group to this section. (Left photo) After the ride at Kiara, both groups met at a coffee shop nearby. 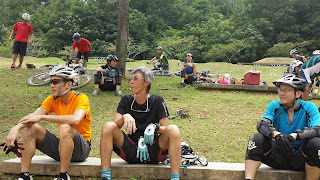 I was almost dehydrated, trying to conserve water inside Bukit Kiara in anticipation of long ride. I swallowed 2 cans of 100plus before ordering food. 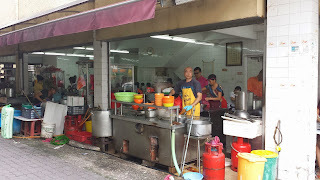 (Left photo) Most of us ordered this prawn noodles, as it was the signature dish in this coffeeshop. 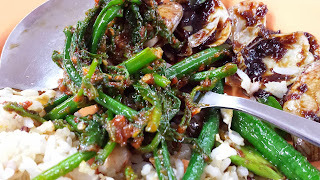 Quite delicious, but not too sure if it was due to hunger or the food was really good. 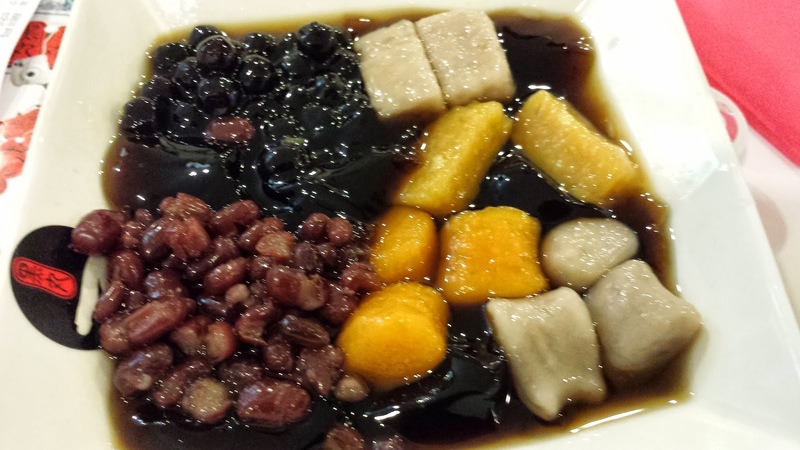 (Left photo) Rebecca ordered this dish, fusion of yong tao fu with chee chiong fan. Quite tasty, don't think Singapore has it. 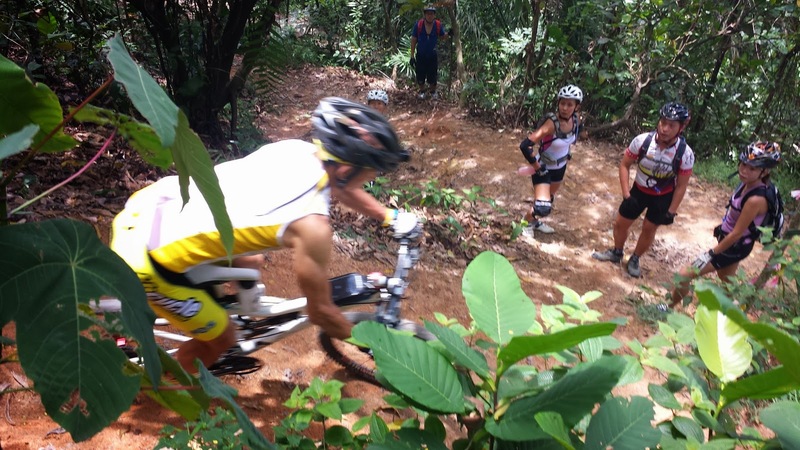 (Left Photo) We were fortunate to have Kenny and Jessen to coach us at Bukit Kiara. Although I have attempted many similar sections elsewhere, learning the proper way to tackle those sections will surely boost up my confidence and diminish errors when face with similar situation in future. 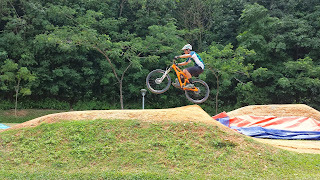 I was riding Nomad with 32T single chainring and fat Hans DH tires on both wheels. 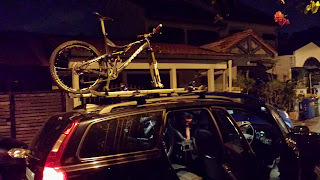 Not an ideal setup for climb in Kiara, but totally awesome for downhill. My fixed seatpost did not help either, a KS dropper will be perfect. While climbing those steep slope, I really wish my rig was Pivot Mach 6. 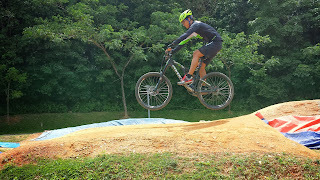 Personally, I think M6 with XX1 and variable dropper will be an ideal setup for Kiara ride, especially for weekend rider like me. Will definitely go back to whack Kiara again...once I got my M6! Kenny and Jessen were patience, tactful and extremely professional. They made us repeat the rides over and over again until we got it right.We could feel their eagerness to impart their skill to us. They are the best mountain bike instructors we could ever ask for. Highly recommended! 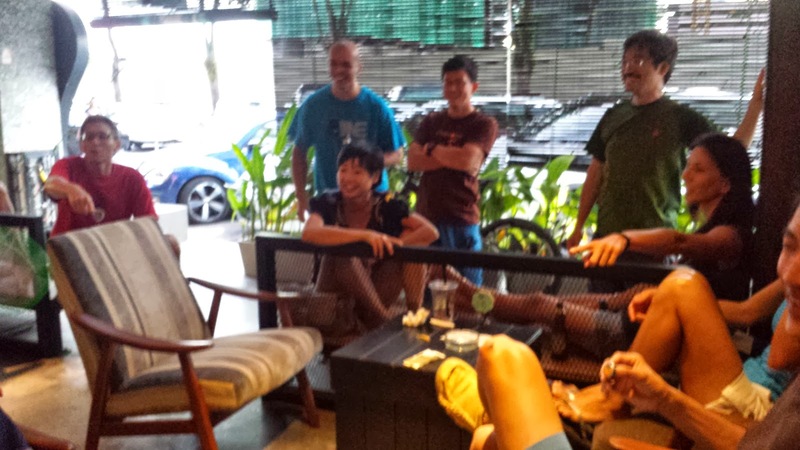 (Photo: James Yap) Met with James Yap briefly in KL. 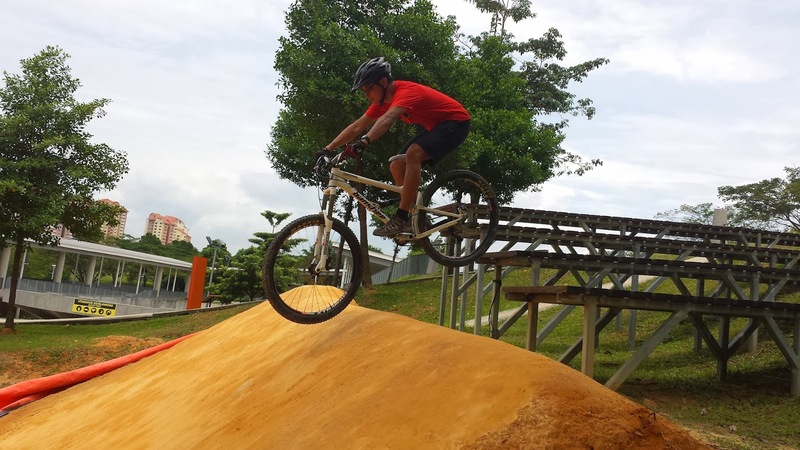 He is a skillful and avid mountain biker, and one of the pioneer members to make mountain biking possible in Bukit Kiara. According to James, there are stories behind the names of Kiara trails. With James permission, I reproduced his comments on the following paragraphs. 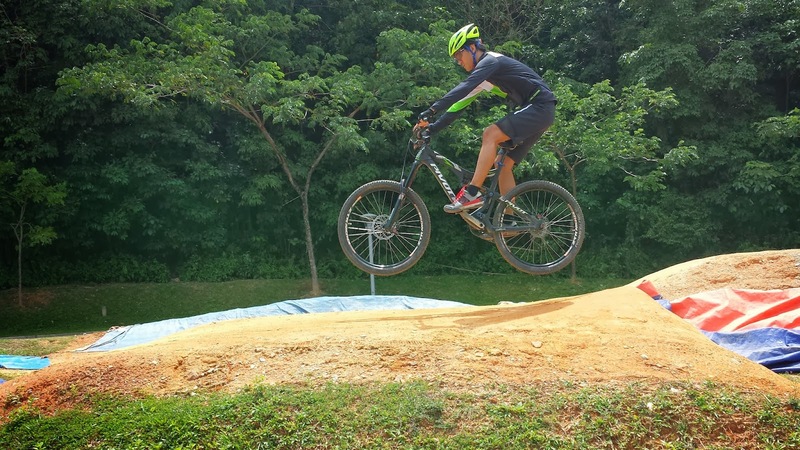 Office & Overtime Trails: One day, an avid mountain biker by the name of Steve decided that the trail he was going to build would be his office for the next 2 months. During that time, he singlehandedly carved out the trail. No one knew about the "Office" existence until it was almost completed. Like all good stuff, it was meant to be shared. Many of his fellow mountain biker's buddies helped him pre-run the trails and haul out rubbish such as old fridge, porcelain toilet and etc. Not contented with the "Office" trail, Steve built an extension which, took on the name, "Overtime" trail. Coronary Bypass/Lungbuster/Chunder Junction: Right above the "Office" trail is a trail named Coronary Bypass. Why? Well, the parallel trail was called Lungbuster and for good reason. It was super steep. Hardly any chance to rest and recover. It sucked the wind out of you and will give you a heart attack. To avoid the impending coronary catastrophe, Coronary Bypass was built. 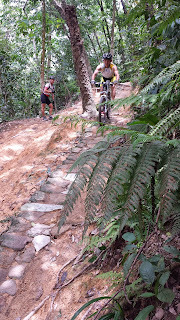 The switchbacks eased the climbing. Chunder Junction marks the end of Lung Buster. The not so fit riders usually do a 'chunder' at this junction, ie: vomit. 2k/4K: This trail was supposed to be10km. The names of the trails represent the distance. At the time of this writing, 2K was pretty much the same except for a rerouted entrance as the original one went straight to the bottom. The inner loop was lost by deadfall and reclaimed by the jungle. Recently the trails was opened and modified. Currently, 4K is nowhere near it's original state. It's been chopped up and rerouted too many times. 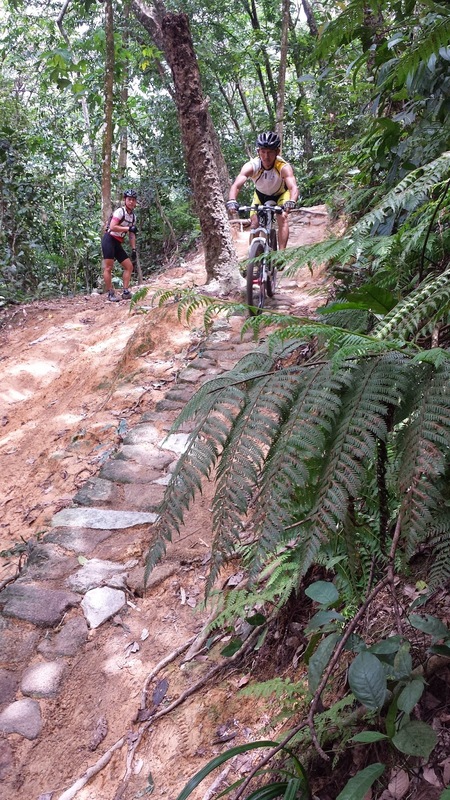 Its evolution ends in a super technical downhill which was part of inaugural Enduro series. 4K was no longer 4 kilometres long. Bar-A-Kuda: Commonly mistaken for Barracuda. Mountain bikers were getting annoyed with equestrian riders at one point in time and the heavy horse shoe hoof were decimating the trails to a muddy slurry mess. And so low hanging barriers were slung over the trails to prevent equestrian intrusion. Hence : Bar-A-Kuda. Wasteland: Bar-A-Kuda used to connect to a trail named Boulder which is now all million dollar homes. And so the present Bar-A-Kuda terminates with the start of Wasteland. That multi-switchback descent to a creek which is spanned by a skinny. If you think the present skinny is terrifying. It used to be a proper skinny: as in you ride on top of a log to get from end to end. 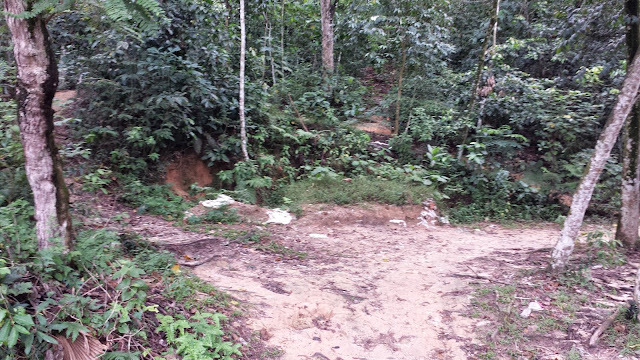 The developer bulldozed the entire land around the boulder down to the valley below. The trail was a wasteland, and used to have a deeper valley below. The valley had been filled up. 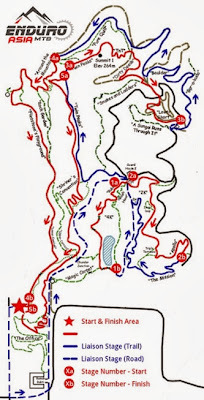 Snakes and ladders: We used to exit the boulder trail and ride on the tarmac to get to 4 way junction where we would choose to ride twin peaks or 2K. Some mat sallehs then cut a parallel offroad trail to connect to 4way/twin peaks climb. 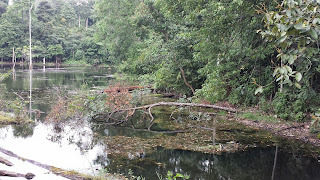 The trail builders had a few encounters with snakes. And of course, the entrance to Snake and Ladders used to be by a ladder bridge. Hence Snake and Ladders. Snakes and ladders has a super technical cobblestone double switchback followed by a rocky climb. Damn tough to do! Janie's Addiction: Late 90's. Back then there was this character called Janie Ravenhurst. 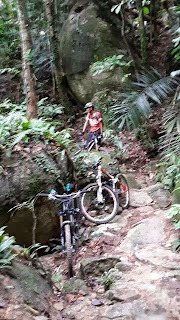 The story is that she was convinced, like a religious fanatic that there must be a way down from twin peaks to connect to the old-Pondok to Pondok (extinct) trail. She was so obsessed in looking for that connection that when it was made, they named it Janie's Addiction. 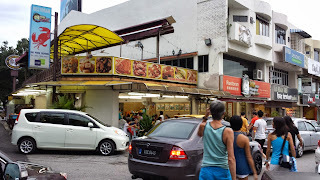 Today, Janie's serves as the connection to Kampung, Flintstones and Pure Quill. 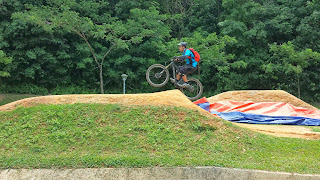 Triple terrace: Sounds better than, "Faceplant and die" or "Collarbone Koyak". Triple terrace, functional. 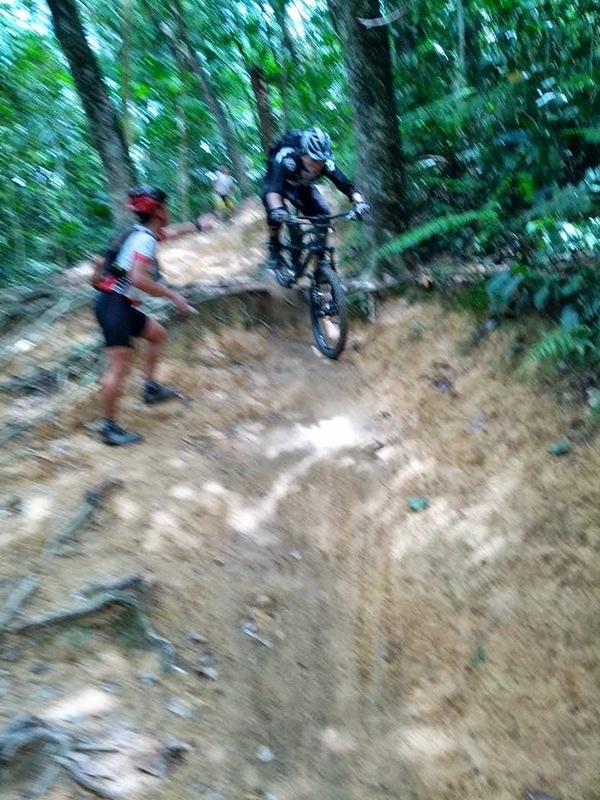 Goes straight down 3 of the rubber terraces. One of the original Kiara obstacles since time. (Left photo) After refreshing ourselves, we hung around the cafe located below the hotel. 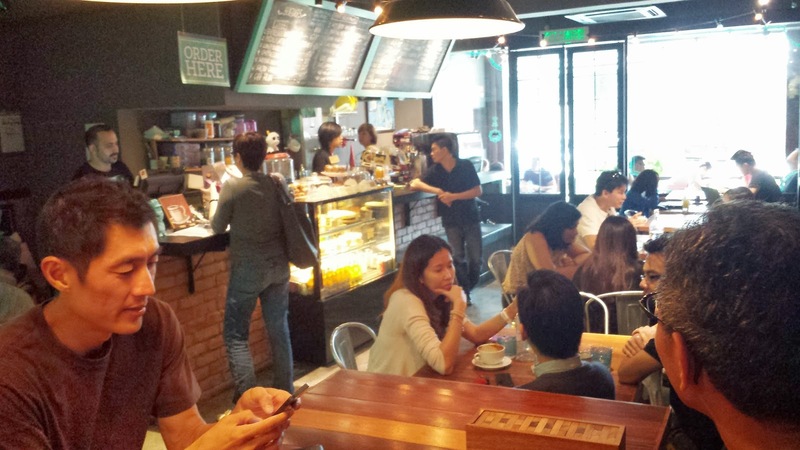 This cafe resembled Penny University Cafe at East Cost Road back in Singapore. Chee Han was impressed with the cappuccino. I ordered lemonade while Chi Wei went for ice tea. (Left photo) After coffee, Ming and I went for one hour massage near the hotel. I did 1 hour leg massage while Ming went for leg and shoulder. 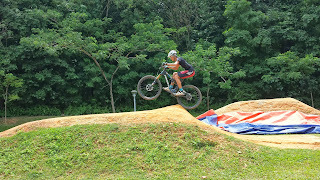 It only cost 45 ringgit for 1 hour session. I cautious the masseur about my right ankle surgery 4 months ago. Ming was quick to cautious the masseur his left ankle too. 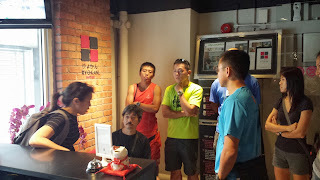 The masseurs stared at us, wondering what the hack was going on! The massage was awesome, especially after the long rides. We felt like new born babies after that. 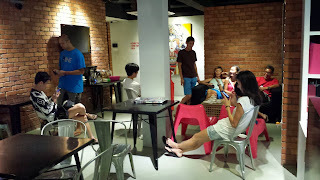 (Left photo) After massage, we went back to the cafe and realized the whole group were there having a good time chatting and joking. 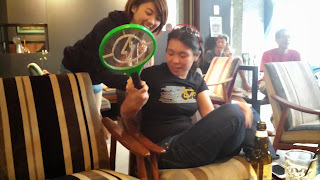 (Left photo) Jonie was trying out the flies electrocuting racket. 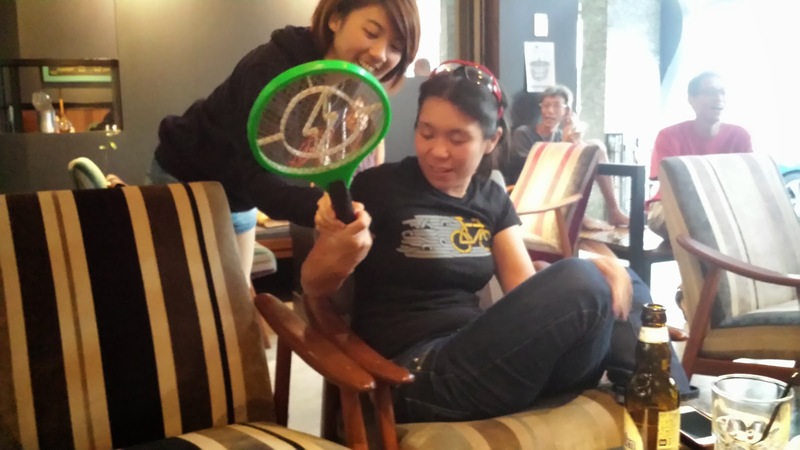 She managed to electrocute heaps of mosquitoes with this cool gadget. In fact, there were so many mosquitoes that they flew directly onto the racket. 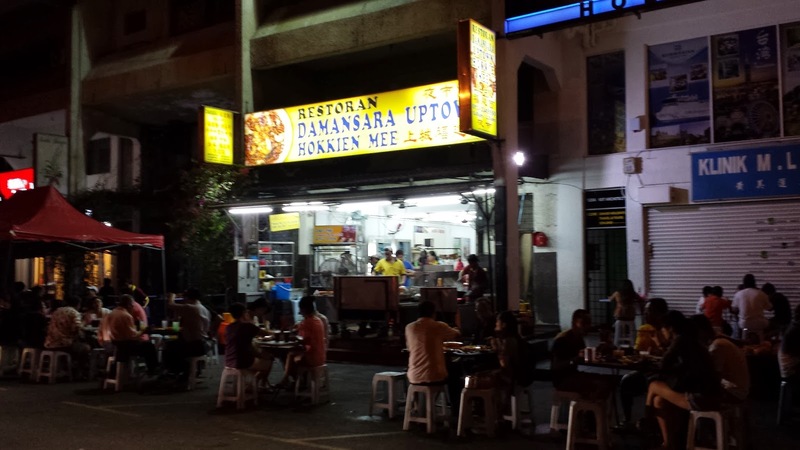 (Left photo) We went back to the famous hokkien prawn noodle stall for dinner. Glad that Kenny and Jessen could join us for dinner as well. After dinner, we shopped around the neighborhood and finished the day with deserts. 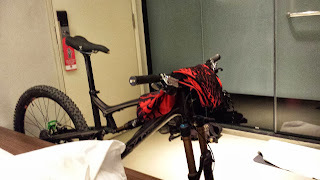 (Left photo) Back to the hotel room, I started to pack for next day ride at Putrajaya Challenge Park, and get myself organize for check out next morning. Last day in KL. 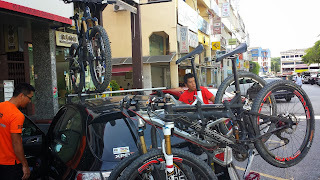 Sad to go home but excited to go Putrajaya Bike Park. 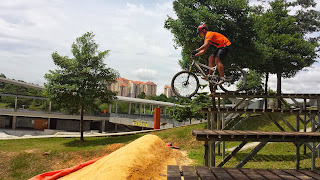 Putrajaya Bike Park is just approximately 35 km south of Kuala Lumpur. 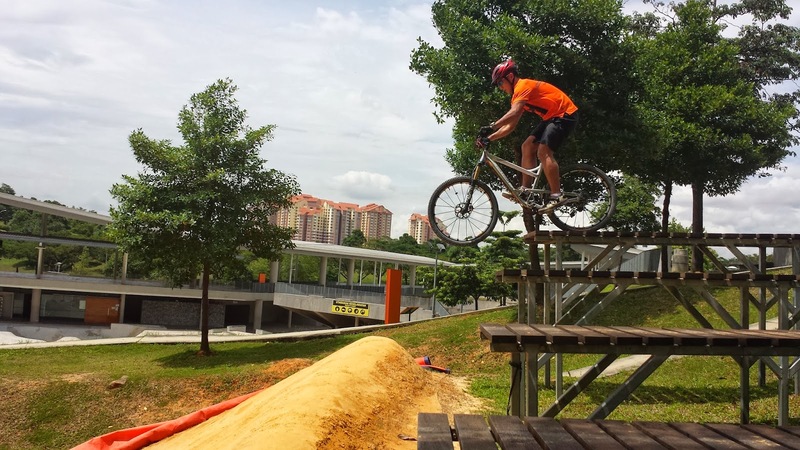 The bike park is heaven for riders who love extreme sports. 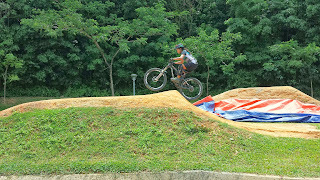 The official name is called Putrajaya Challenge Park. 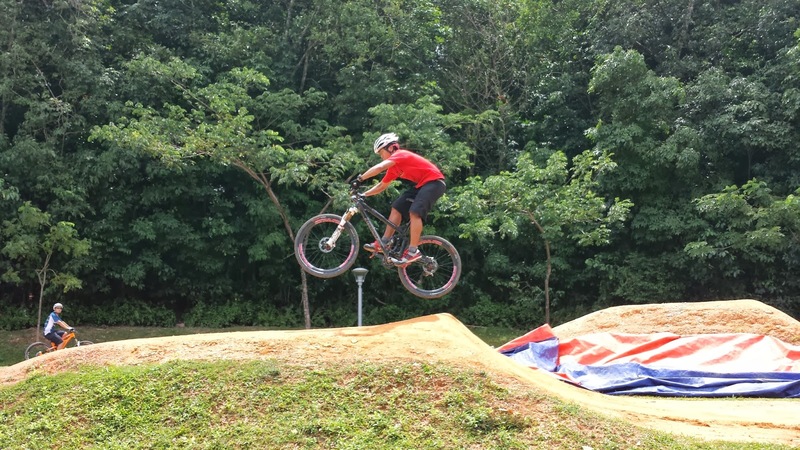 Facilities include skateboarding, pump tracks, free rides, dirt jumps, and a well crafted 5.8 km XC trails. 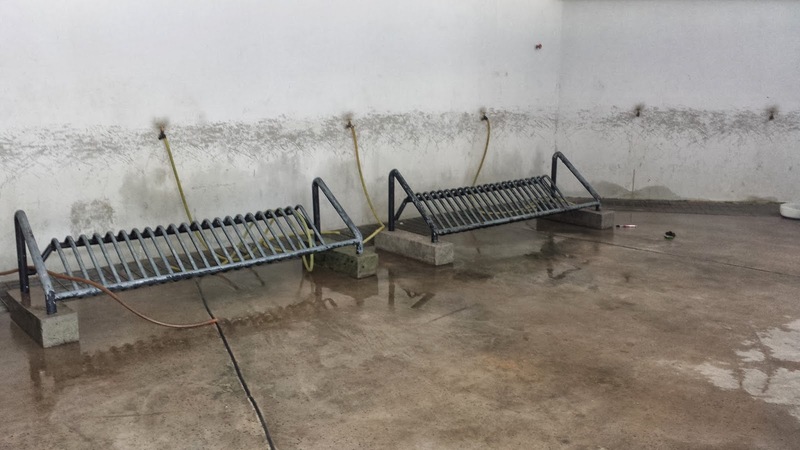 There are amble car park, shower facility and bike wash bay. The best part is, they are free! Click here for direction to Putrajaya Bike Park. 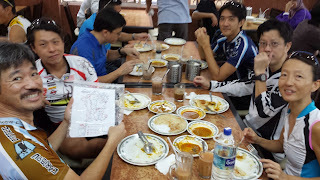 (Photo) Some of us had our breakfast in the hotel while early birds had Tim Sum at nearby restaurant. We checked out the hotel about 9am. As Ming was staying in Jason's house in KL, Wilson offered to send me to the bike park. We got 3 bikes hanging onto this car! 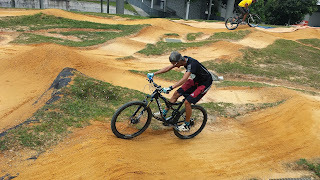 (Left photo) I was quite impressed with the bike park. It looks quite posh, feel like country club. (Left photo) It is always nice to have Jacks around. Always so helpful and thoughtful. We assembled our bikes and ready to rock! 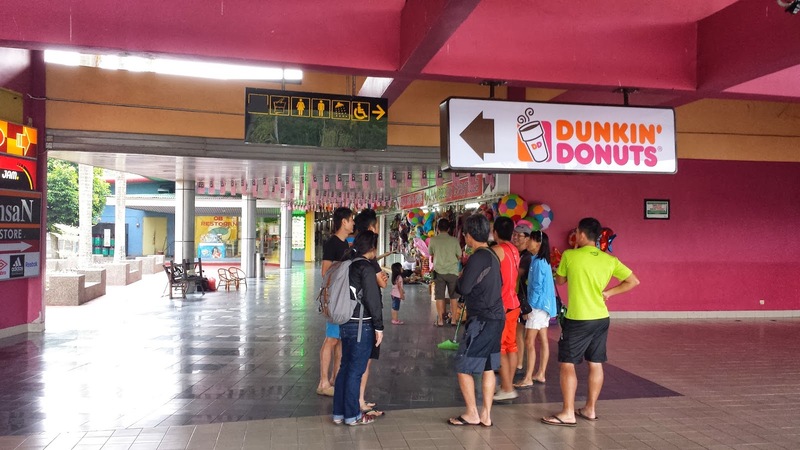 (Left photo) Once you entered the main entrance, you will be greeted by a skate park and shower facilities. We were trying to orientate ourselves, and deciding where to go first. 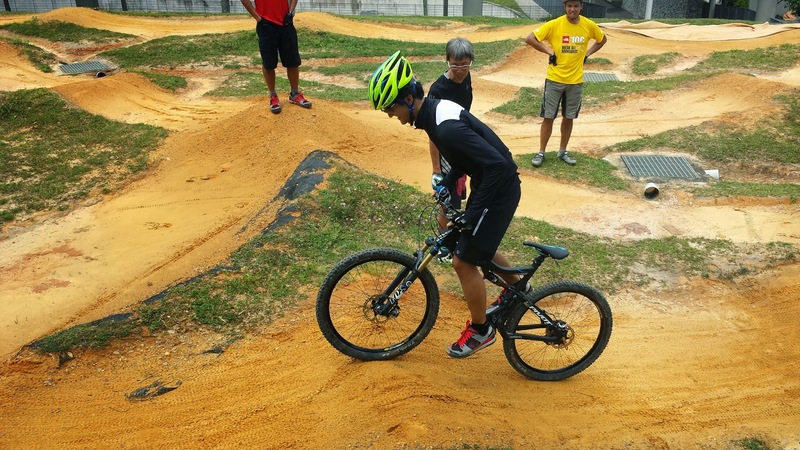 (Left photo) Obviously we should ride the 5.8 km XC trails before going for the pump tracks and dirt jumps. The XC tracks were flowy with manageable climbs. 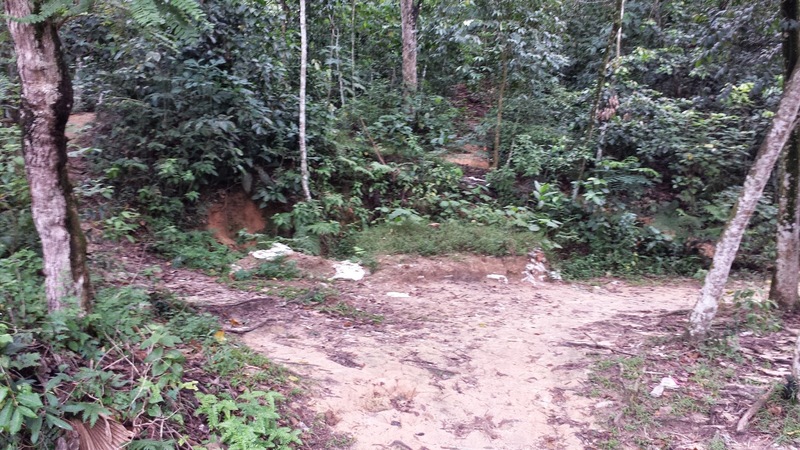 However, some of the section were eroded and in need of maintenance. 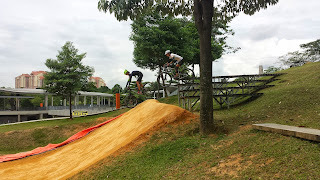 (Left photo) After the XC ride, we went for free cross track. Sarge is an awesome rider. 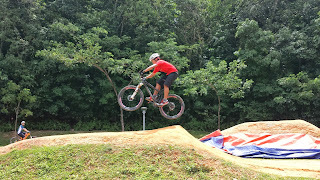 He was showing us how to jump like a pro on a trail bike! I did not attempt this due to swollen thumb and warning from wife, as I was still recovering from broken ankle. Don't want to miss November Bangkok and Korea holidays. (Left photo) Hans is a highly competitive and skillful rider. In fact, he is born to ride. 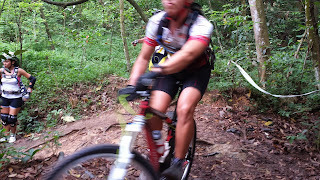 He won numerous XC team race, together with Wilson, Bren, Ting and others. 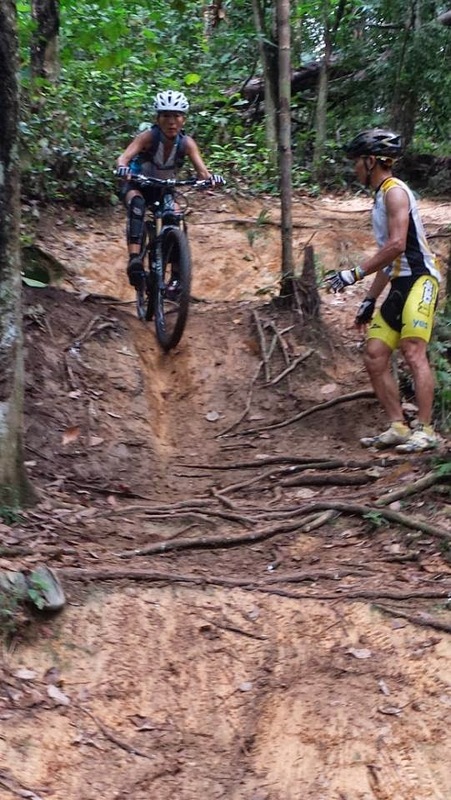 (Left photo) Wilson was showing us what XC bike can do in this free cross track! (Left photo) Do I need to say more? 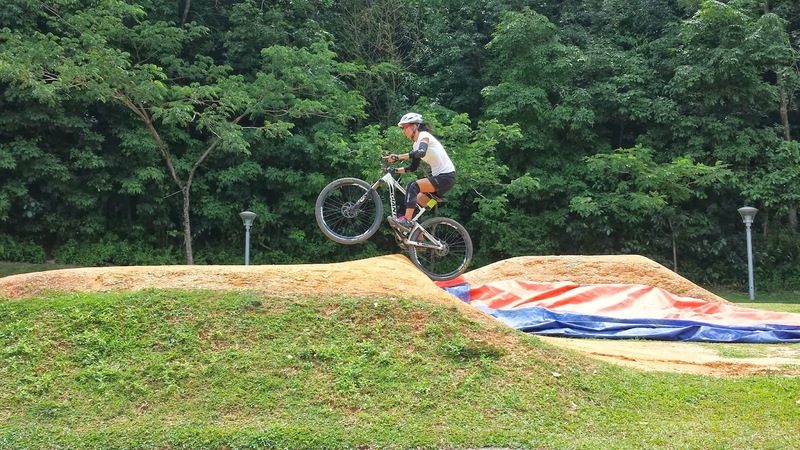 Our champion Jason Tan! (Left photo) I was amazed Jacks did that jump with his battle ready backpack! (Left photo) What Nik can do Pei Ling can do as well! (Left photo) I was very impressed by what Kee Leng can do. Perhaps, she has Sarge genes...or the other way round? 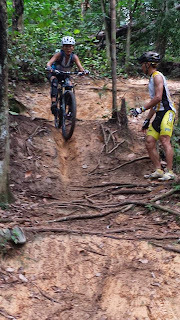 (Left photo) Our Asia Enduro Champion Jonie! (Left photo) If you think beauty, brain and physique do not mix, you are damn wrong. Ting has all! 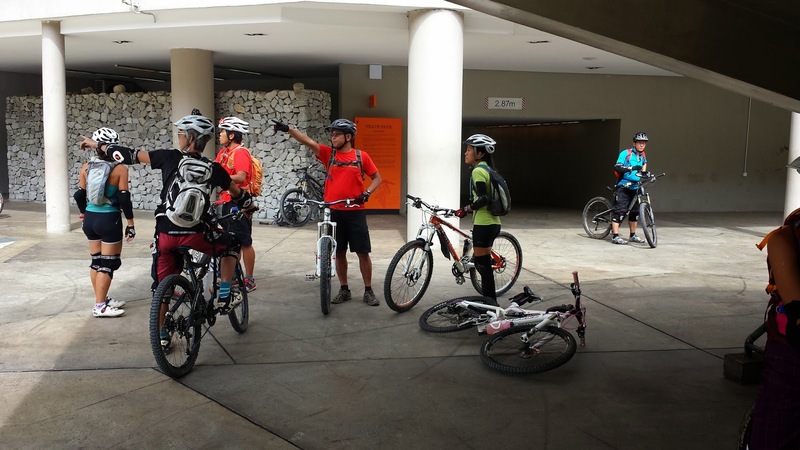 (Left photo) Don't be deceived by Yew Weng emotionless look while riding. He can sail through any terrains and climb any mountain with ease! (Left photo) After we had enough of free cross track, we proceeded to the pump tracks. Nik removed the chain from his Mach 5.7 and challenged us to see who could pump furthest. I tried it with my Nomad but my swollen thumb was too painful to do the pull and push. 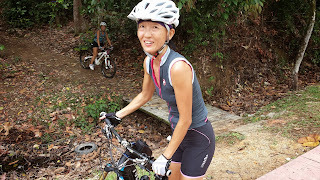 (Left photo) Nik was laughing at Ting as she struggled to keep the momentum. (Left photo) Hans was doing pretty well, and managed to get hold of it quickly. Talented rider indeed. 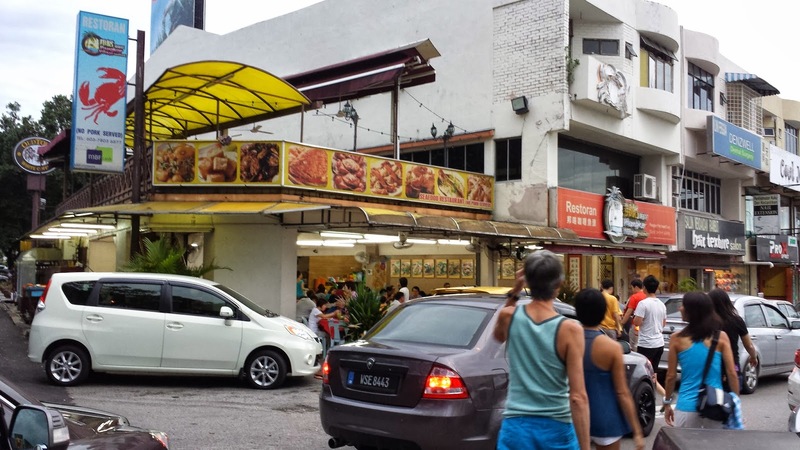 (Left photo) Yew Weng was doing well. He should be able to do better without the hydration bag, must be carrying lots of gold bar in his bag. (Left photo) Christina was doing well too! (Left photo) Bren is the strongest of all. I witness he blasted off Nik's rear tire as he pumped the bike! The rear tire laterally exploded, and the sealants splashed out like fountain. Amazing strength! (Left photo) The winner is offcourse Jason Tan. He could perpetually pumped round the tracks as long as he wanted. Super awesome! 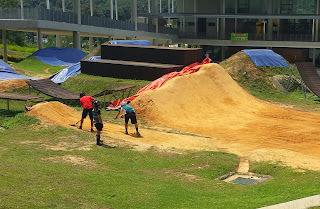 (Left photo) After pump track, we proceed to dirt jump. Some of us were resting under the shade while watching the brave ones did the drop and jump. (Left photo) Sarge did it again. He tried all levels and did a few jumps successfully. (Left photo) Hans was the most active rider in this group. He did all the drops and jumps with his Mach 5.7. He wanted to do group drop so badly. Only Ting game enough to join him. (Left photo) Our Hercules Bren in action. 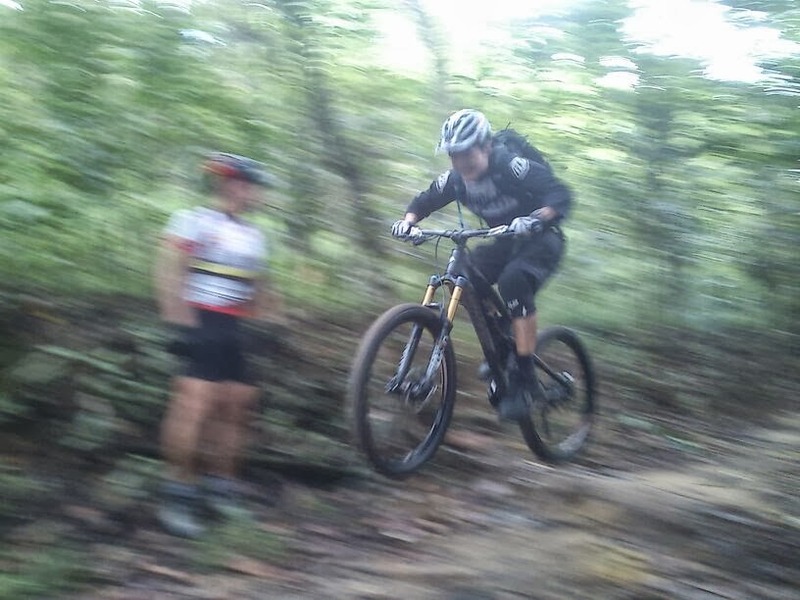 He attempted the highest drop on his trail bike. (Left photo) Finally, Hans got what he wish for. Beautiful drop! 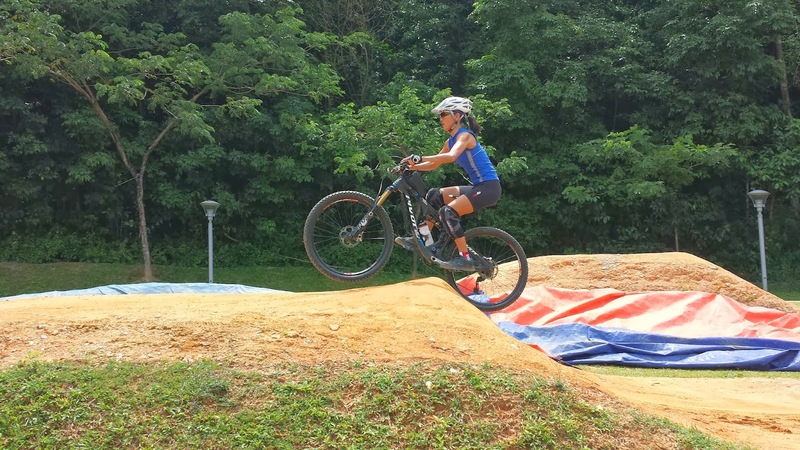 Respect Ting for using her XC bike to do all these stuffs. You should be there to witness it. (Left photo) After the rides, Jason, Jonie and Sarge patched up the tracks damaged by our brakes. 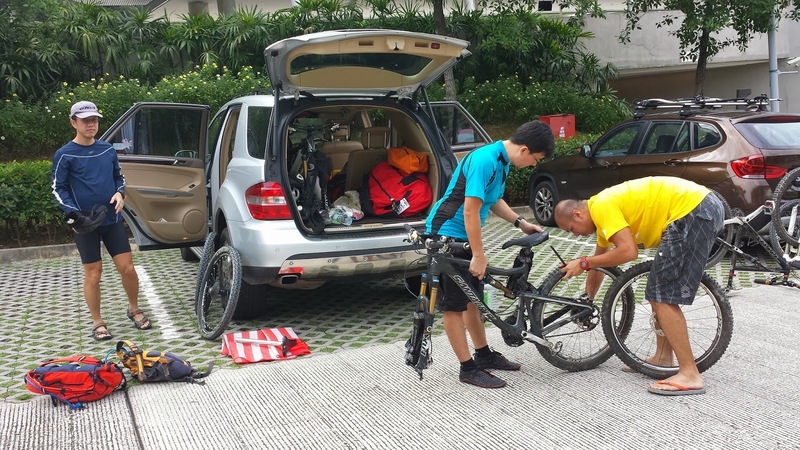 (Left photo) Only Hans and Chee Han wash their bikes at the bike park. 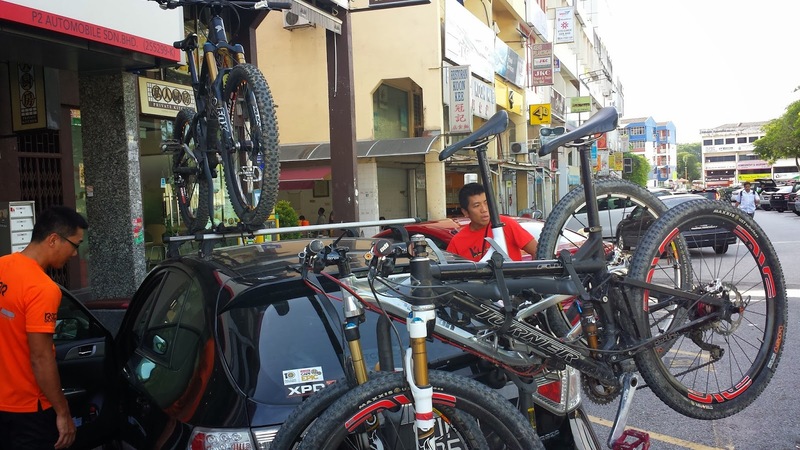 Our bikes were reasonably clean after 3 days of ride in KL. 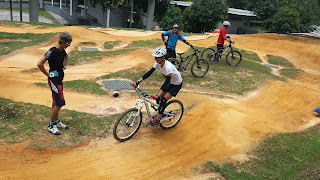 It goes to show that trails in Damansara, Kiara and Putrajaya were well constructed and drained. BTW, my Hans tires are too wide to fit onto these bike racks! (Left photo) There is a snack bar on the second level of this bike park. After shower, we replenished our drinks here before driving back to Singapore. 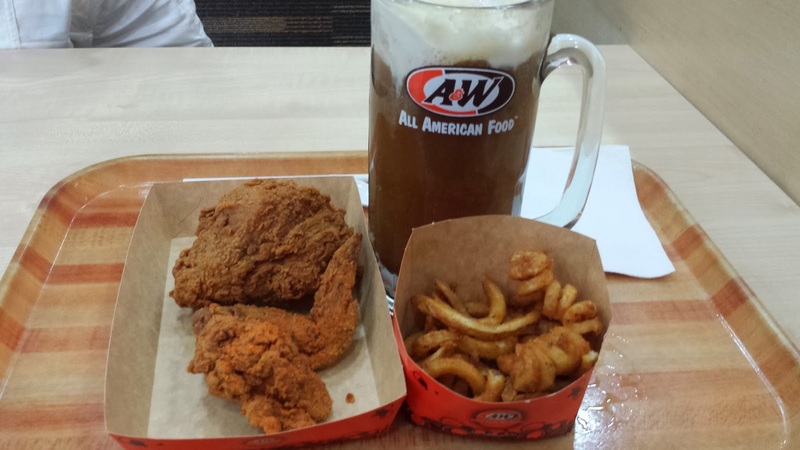 (Left photo) On our way home, we drop by A&W at one of the rest points to fill up our stomach. Wonder why A&W could not survive in Singapore, the root beer float and fried chicken were super yummy! (Left photo) We reached home at about 8pm, as promised by Ming. 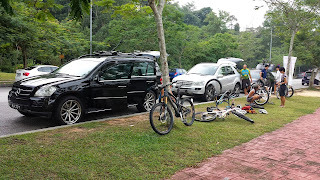 If you asked what I like about this MTB trip in KL, I would say the people I came to know on this trip; and the hospitality of Ming and Christina. They made you feel like part of the family, and would not hesitate to help if needed. 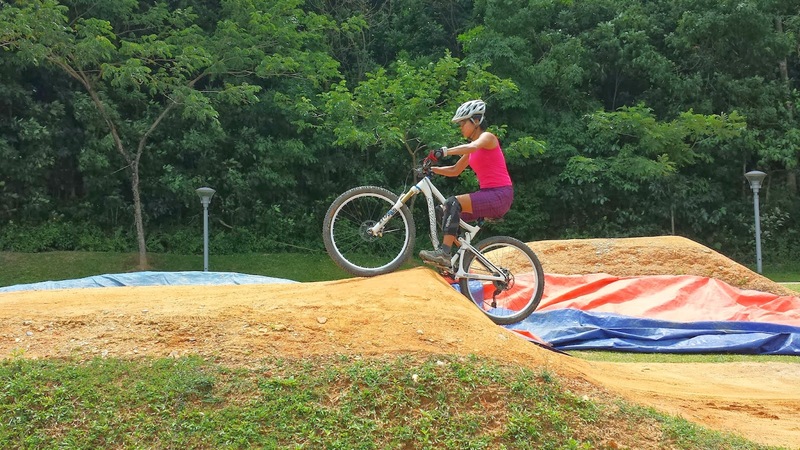 This is what I like about mountain biking, and this riding group. 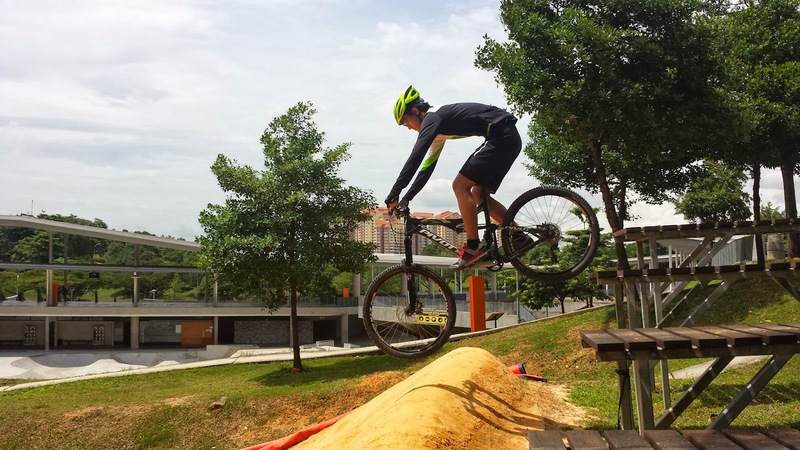 Before I end this posting, let's enjoy a short video below, showing Jason Tan awesome riding skill! My name is Bryan. I am from Kuala Lumpur, Malaysia. I been through your write up and its interesting. 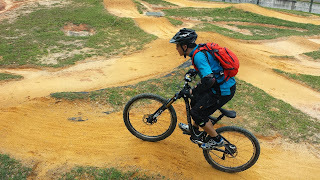 As a matter of fact, we have a Endurance motosports track at Benta, Lipis, Pahang. 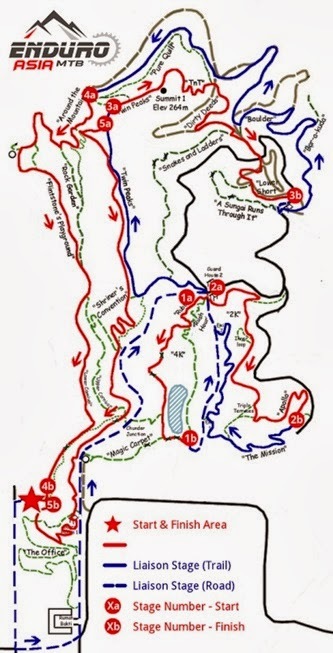 The length is 4.7km (includes up hill, down hill, river crossing, etc). Perhaps you might want to consider to have a event at our track. Hi Bryan, well noted and thanks for the information. Will definitely consider the venue in our next trip. Cheers!